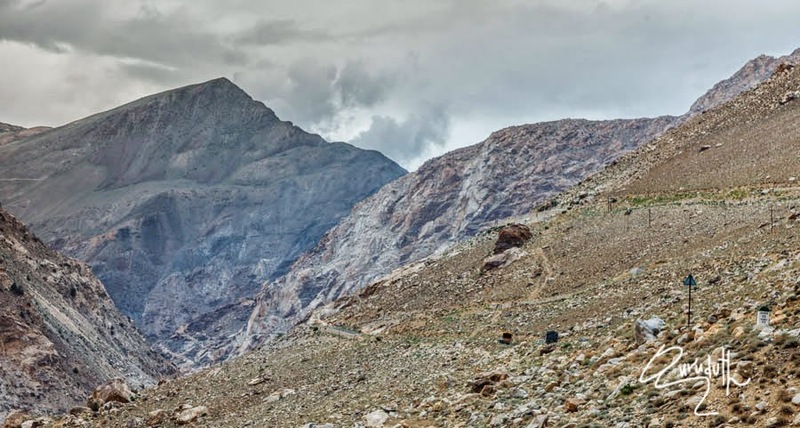 “NAKO” is situated at an altitude of (12,114 feet) above MSL. 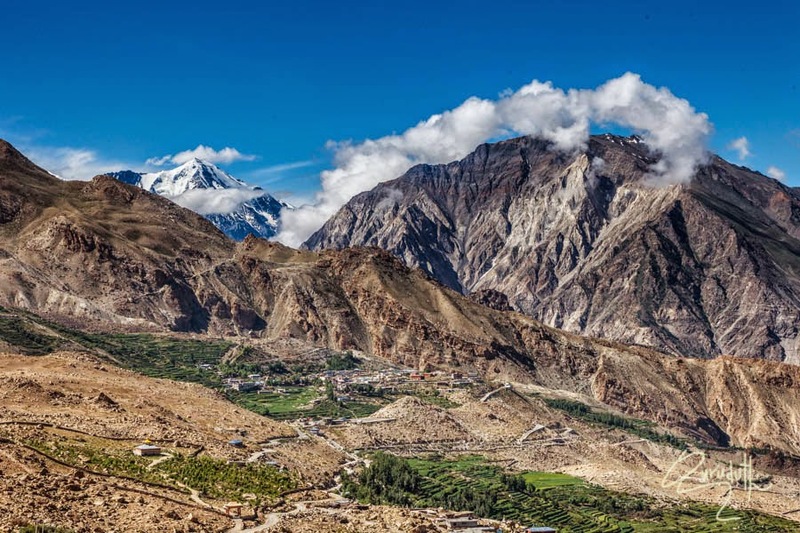 Nako is located in Kinnaur district. 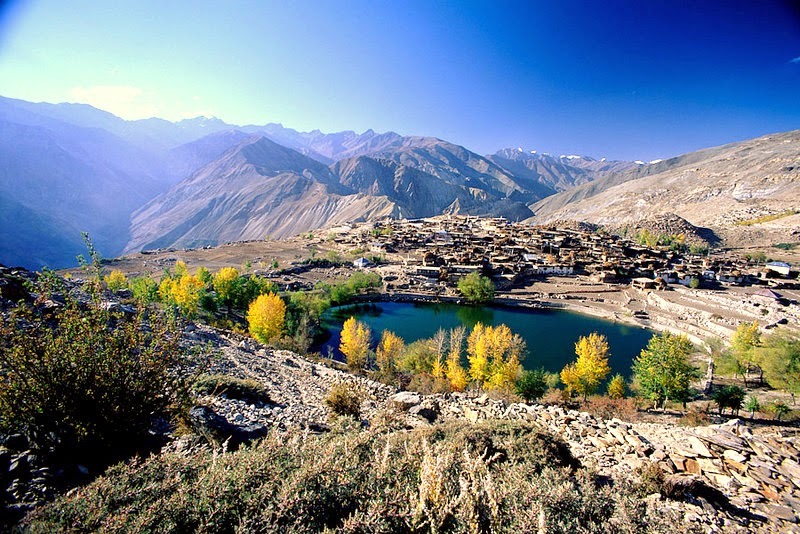 The Nako village is Known for its famous Lake and the Old Monastery, those are located on a small plateau which is in the center of the village. Aerial View of Nako Lake and Nako village. 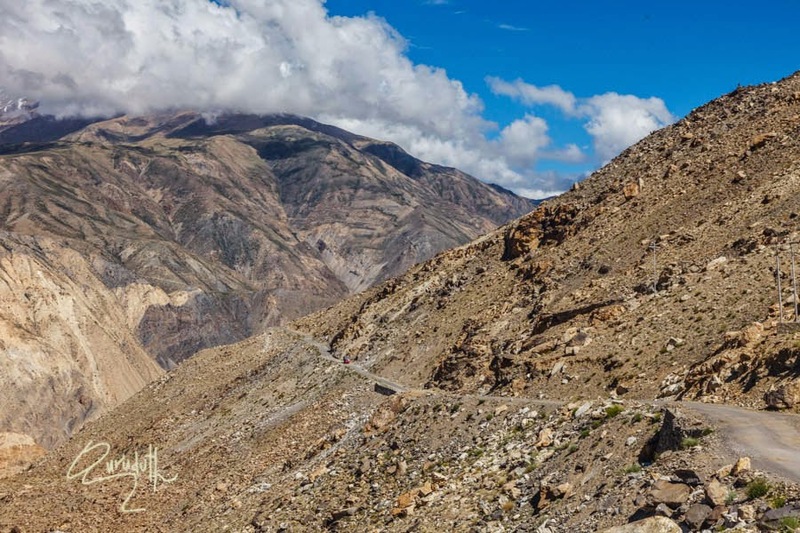 After Yangthang “Y” junction, the Right side of the NH-22 goes to Nako village, through a Helipad and Nako Bus stand. Nako bus stand and Nako Helipad are next to each other. 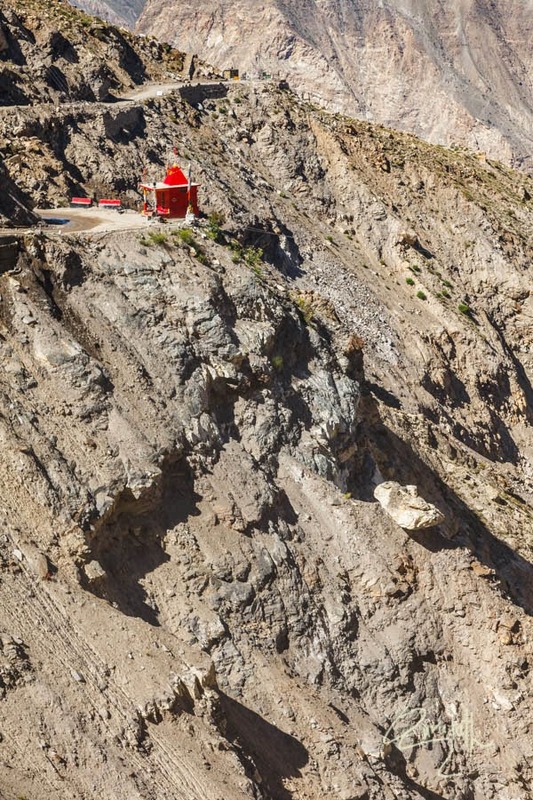 From this Bus stand there is a side road of about 2 Km length that leads to Nako village. We reached Nako at about 1.00 PM. 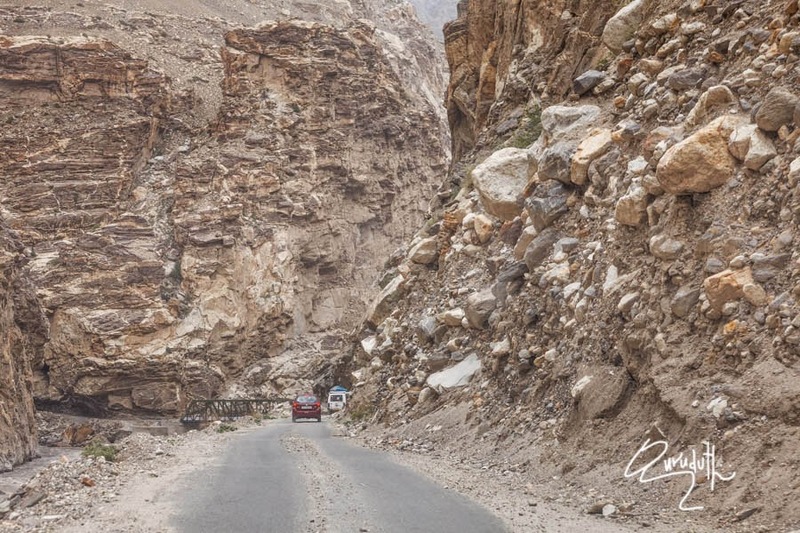 We drove through the narrow road of Nako-village and parked our car in one of the corners, at the entrance of the Nako Monastery. Dalai Lama had conducted “Kalchakra” ceremony” here in 2007. During that time a big beautiful traditional residential building was built for Dalai Lama’s stay. 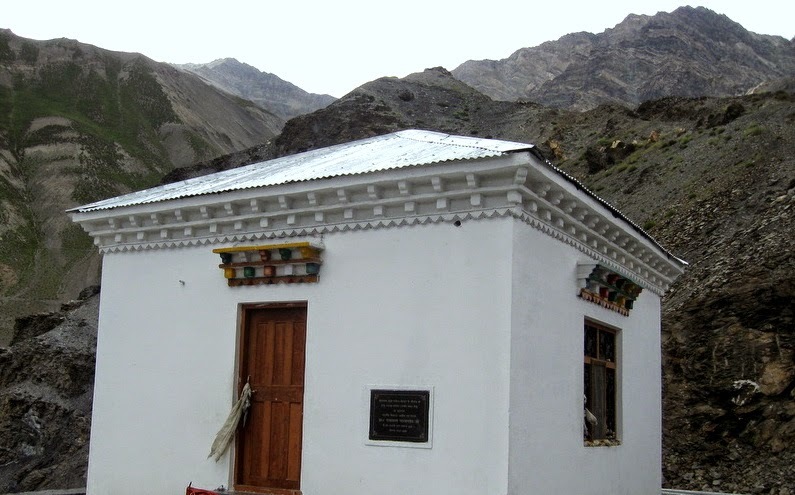 A new Monastery Building too was constructed during the same time of “Kalchakara Ceremony”, which is now used for daily prayers and day to day religious activities of the Monastey. 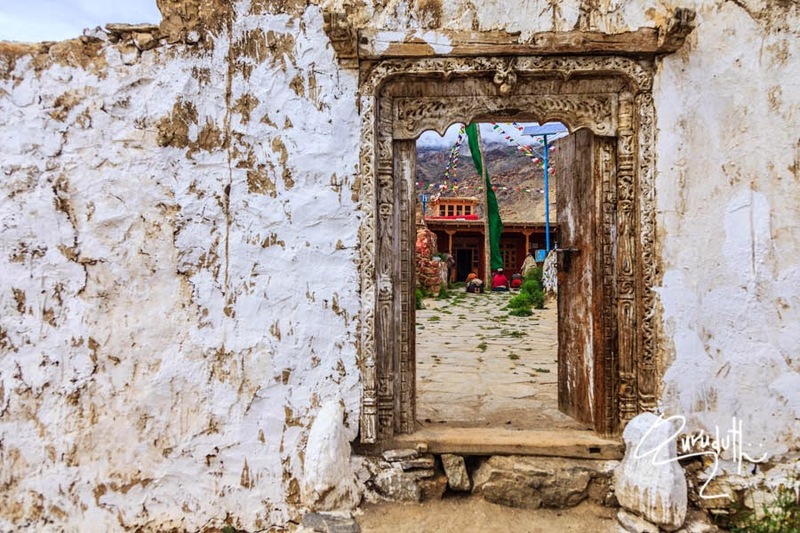 Very adjacent to this newly constructed Monastery building, there is a (900 year old monastery ), that was established by "Lochen Rinchen Zangpo", in the first half of 11th century. Since the old Monastery is a very ancient construction that has become very, very weak. That’s why the New Monastery building was constructed. And this 900 year ancient Monastery structure, just to preserve it is now locked and closed from being used. They open the old monastery structure only on certain special occasions. We were very lucky, because one of the monks obliged our requested of seeing the Old Monastery from inside. He unlocked the door and took us inside. From inside, the old Monastery is awesome. Inside the old monastery, there is a small circular prayer hall, which still has the smell of centuries old ancient fragrance. The old monastery has ancient architecture of just mud and stones and centuries old colourfull murals and paintings, those are faded now, but are awesome. The old Monastery still has a beautiful huge 30 feet high statues of Buddha made of clay and is hand painted with original organic colours. 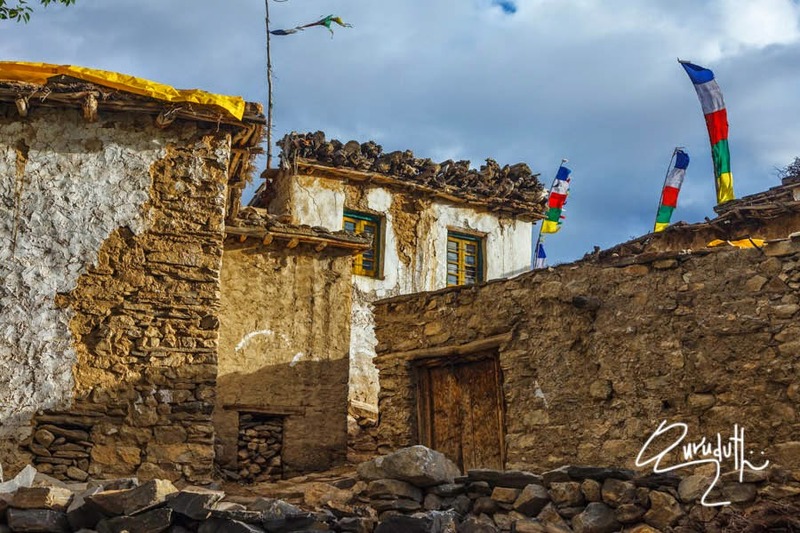 The ancient paintings and the ancient murals, hanging on the walls, still have the faded organic colours which were (as per Lama), painted some 900 years ago. Whatever said and done, I have no words to express the beauty of most artistically intricate geometrical drawings and designs, those have proportionate Dragons and Demons faces. The apt colours combinations and Tanka paintings are exuberantly lively. 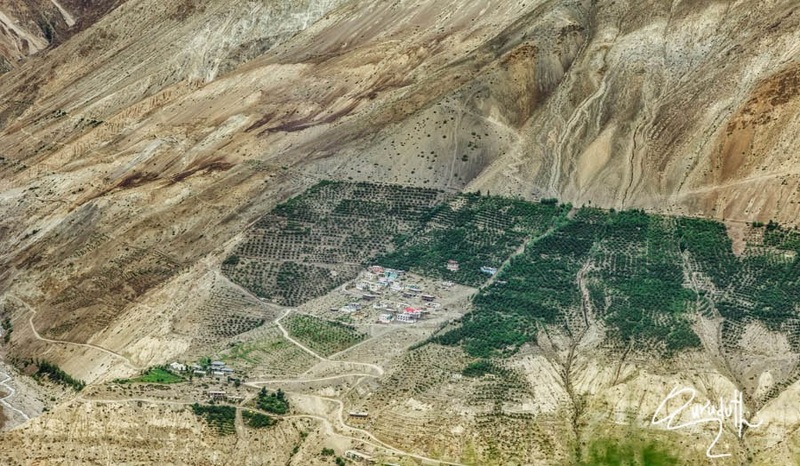 View of Nako’s Old Monastery, which was established by "Lochen Rinchen Zangpo", in the first half of 11th century. Before seeing old Monastery, we entered the new prayer hall of newly constructed Monastery building. Since, it was “Amavase day" when we visited the Nako Monastery. It is a very auspicious day for Nako Buddhist villagers. Nako village Buddhist community’s religious chores of the monthly prayer were going on. As we entered the prayer hall, just to show respect to the religious Congregation, Guruduth and I folded our hands in a “Namaste” posture and to pay respect, we simultaneously bowed our heads too. 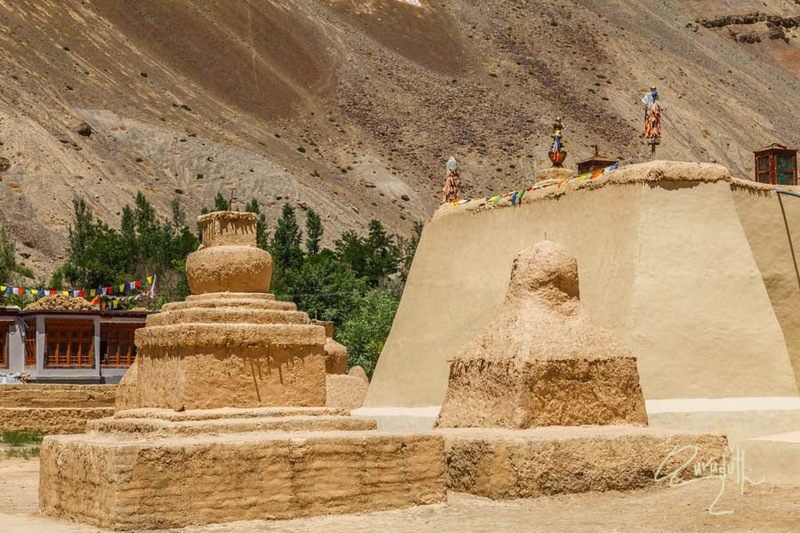 We humbly seeked the permission from Lamas and requested them if we two could join them in their prayers. In Unison every Lams happily gestured us to sit down. We peacefully and composedly sat throughout the whole prayer rituals. The Buddhist Chants sung in soothing unison, were so heavenly, divine, blissful, peaceful and mediating that we felt blessed to be part of this religious rituals. Once the rituals of the prayers were over, we started conversation with the particepents of the prayers. In the congregation, there were males as well as females too. They informed us that the entire polpulation of males and females are married, have their children and lead a normal domestic family life. 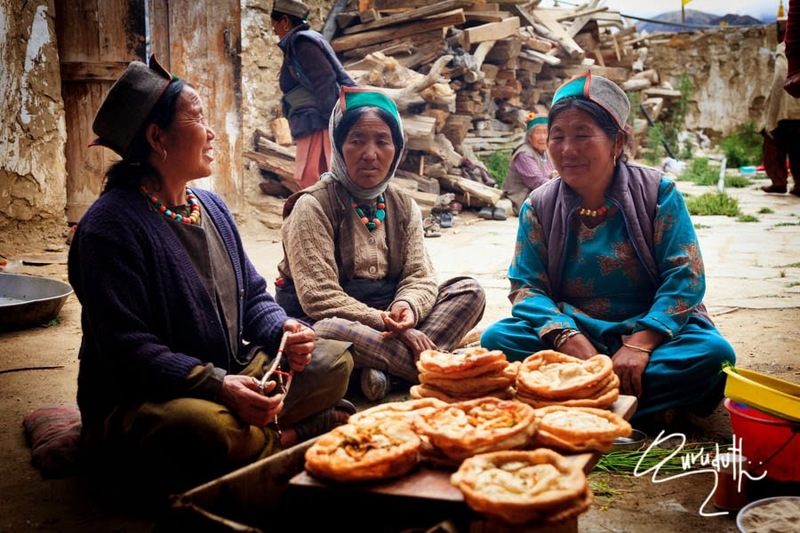 Some of the Lamas are government employees, some of them are teachers and some of them have their own business too. 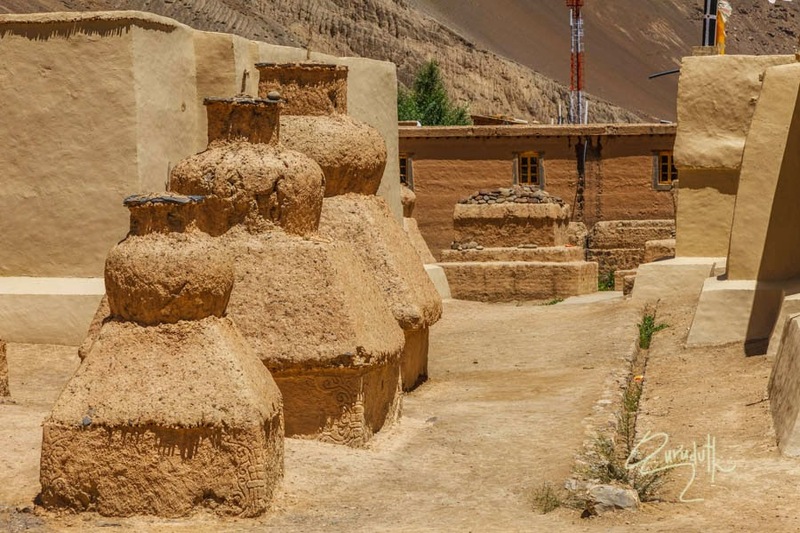 But most of the Lamas are agriculturist. 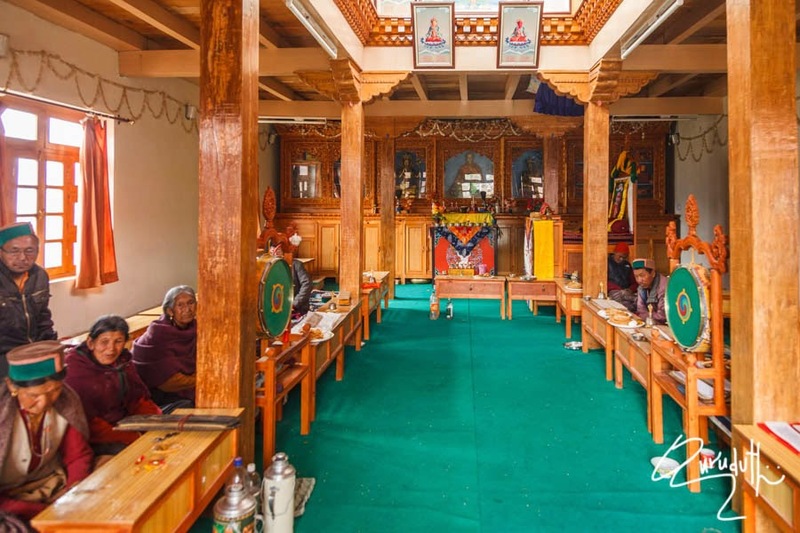 The Monastery of Nako village performs these “Buddhist community religious ritual festive prayers” on every date of 5th, 15th, 25th of every month. Especially during “Amavase” day, it is a very big celebration. 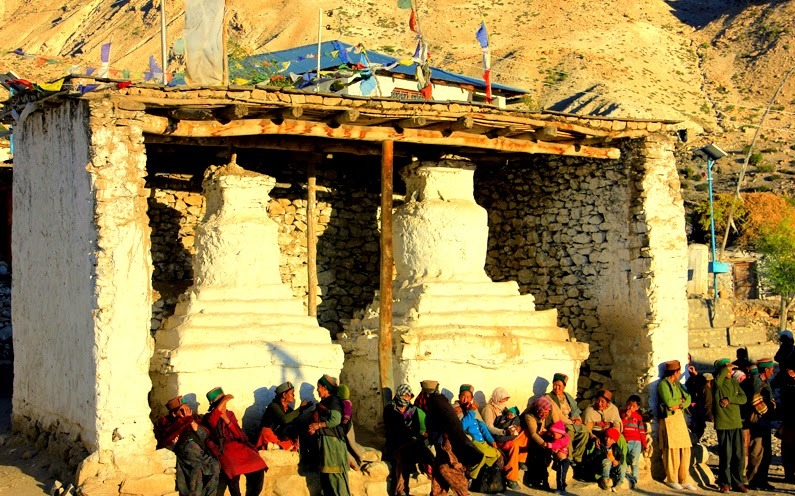 On that day, the whole of Nako village Buddhists folks get together for this celebration. The above series of pictures are the whole sequence of community cooking, serving and relishing the Pradsdam. 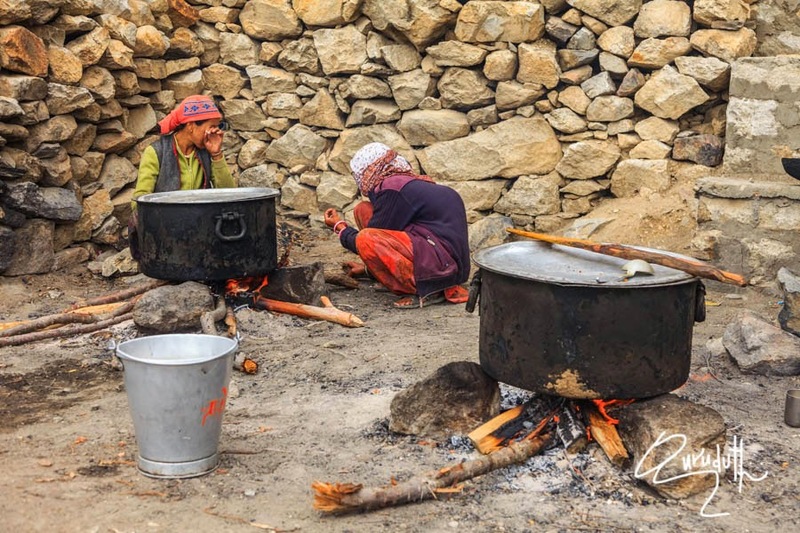 The women folk of whole of Nako town collectively cook in bulk, variety of tasty and delicious food, enough for all the Buddhists of the town. 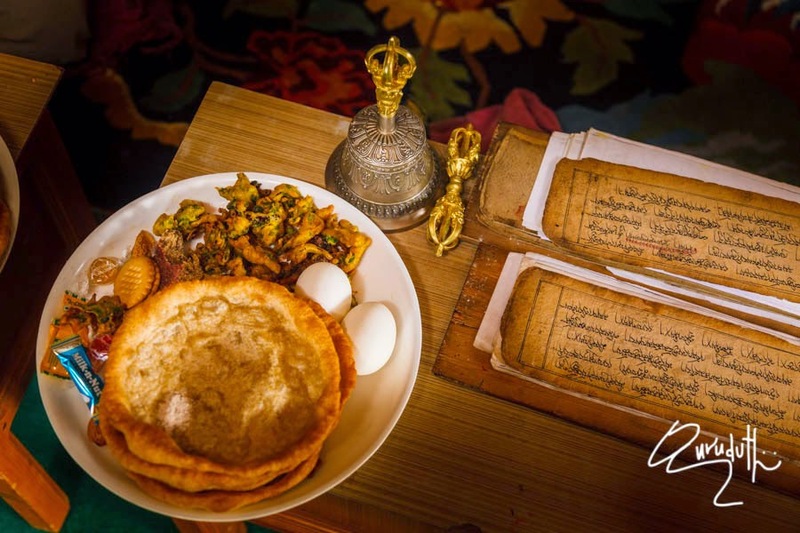 Then once the rituals of the prayers were over, first of all the Eats (as Prasadam) were served to all the Lamas who performed the rituals, in the main hall of the New Monetary. Along with the rest of congregation even Guruduth and I were served the same Prasadam (Eats). The Prasadam that was served consisted of butter tea, biscuits, buns, baked roties and sweets. Then finally after the Prayers ceremony was over, everyone of the whole village were served with rice, sabji (vegetables), rajma dal, baked Roties an Sweets. 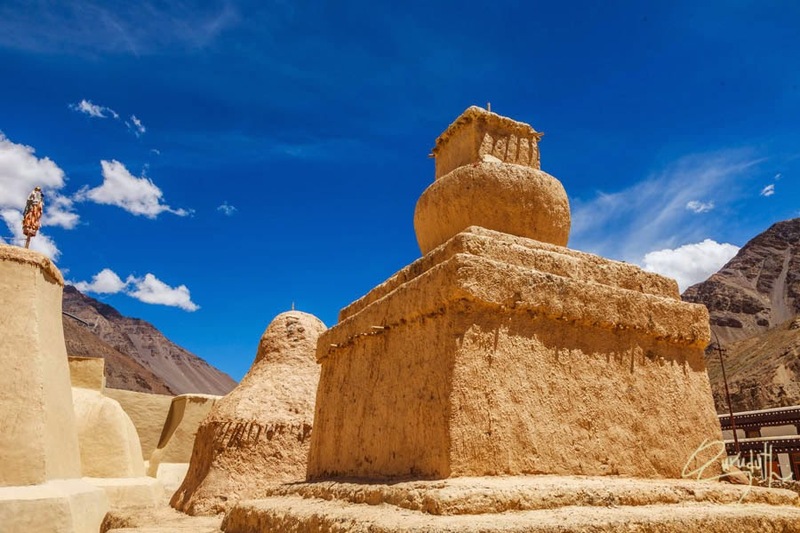 Whole of the old village of NAKO is built in an ancient style. 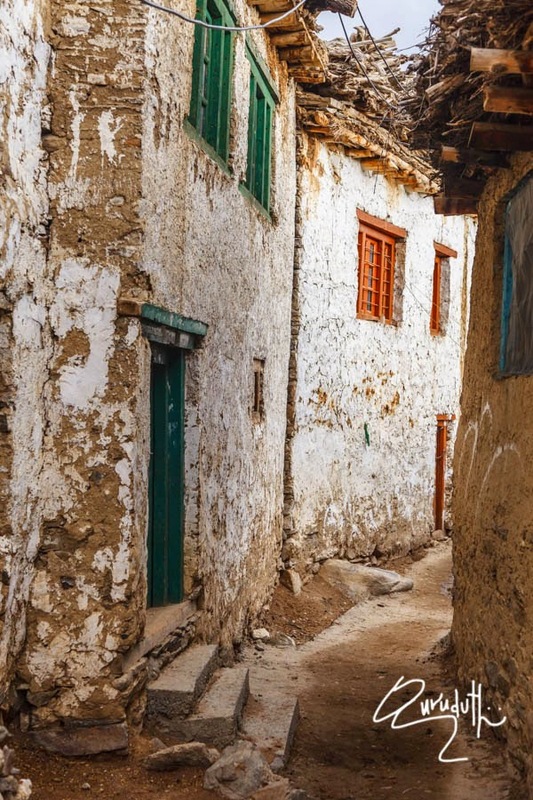 To save themselves from severe winter (--30 degree centigrade), the houses are constructed in such a way that the walls of every house touches the walls of every other connecting house. This prevents the flow of freezing cold winds to pass through. The hoses are small in height, have thick stone walls, and have small entrance doors, small windows with just about five to six feet high roof top. All most every house has three stories. 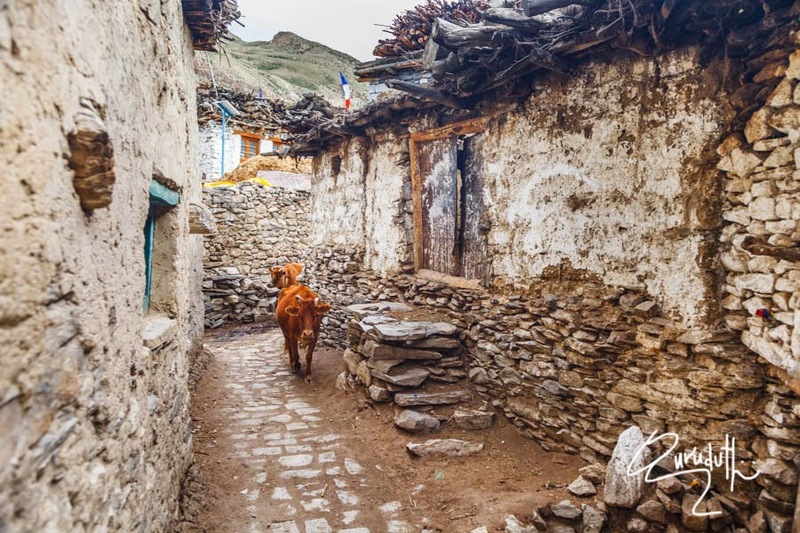 In the lower most floors, they keep their cattle inside the houses, they themselves live on the second floors and then they put all of their household belongings, items and food grains on the third floors. 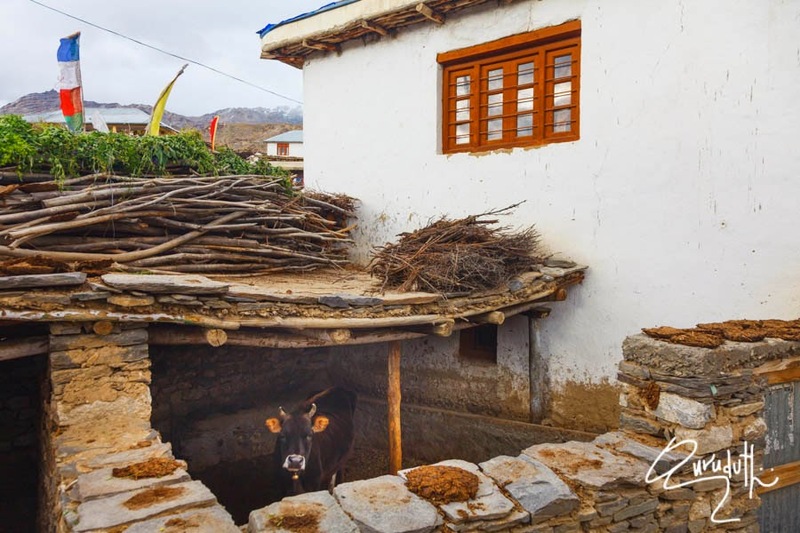 To insulate the roof tops, the roofs of the houses are made of wooden logs, those are covered with very thick layers of Hay. Then the Hay is covered and coated with thick layers of mud. By living in the middle floors of the house, the family members insulate themselves from the sever winter. 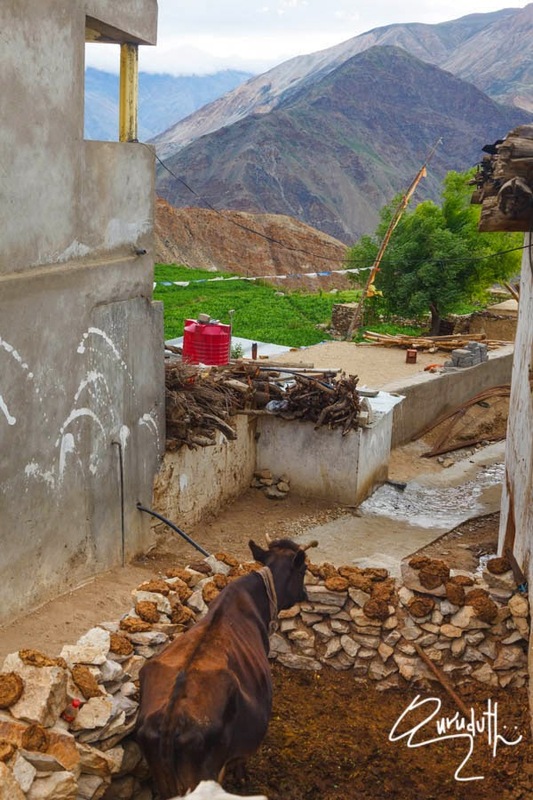 The warmth is generated from the bodies of cattle those are tied at the bottom most floor of the houses as well as from the insulated roof tops. It keeps them warm though out the severe winter. 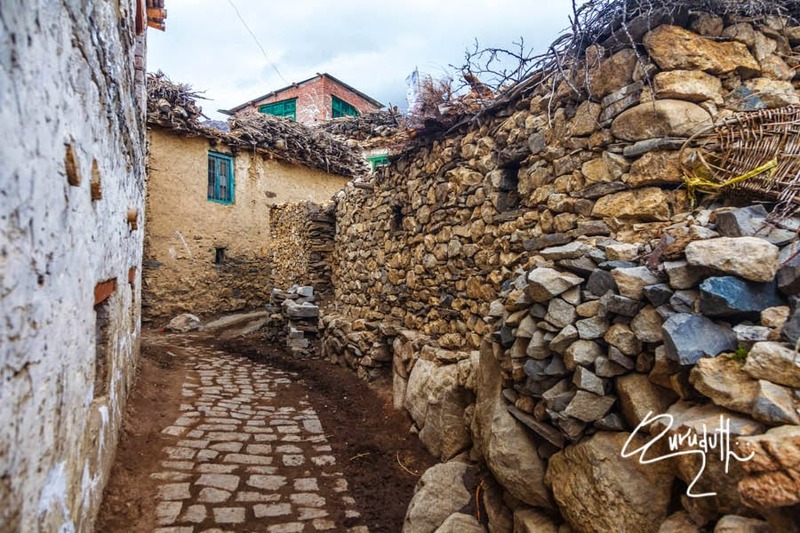 The old town has small narrow inter connecting stone laid lanes, those look like Maze. The old town is settled on one side of the Nako Lake. Once we finished our Prasadam eating at the Monastery, later during the day we checked in one of the hotels named as "Galaxy Guest House" at Rs. 400/- per night. The caretaker was a Nepali boy called as Raju. 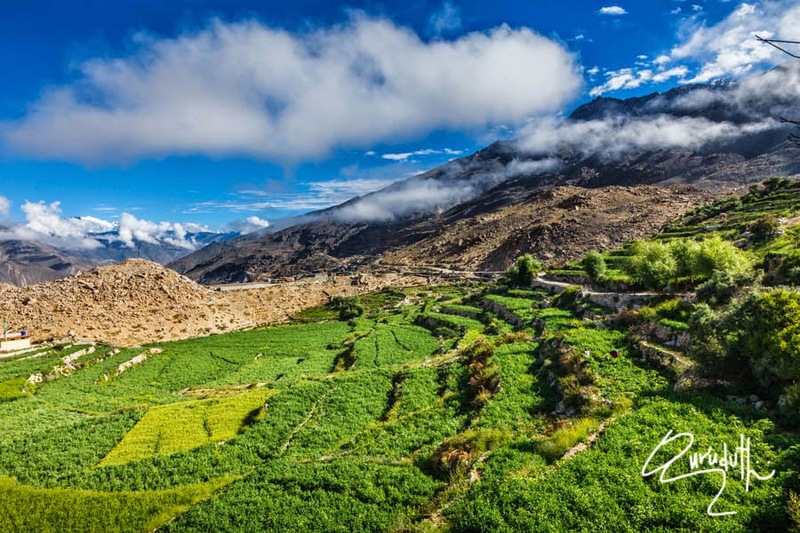 The cash crop of Nako is green peas, which is grown in plenty and is the best in the region for its juiciness, firmness, crispness, sweetness and nutrition value. 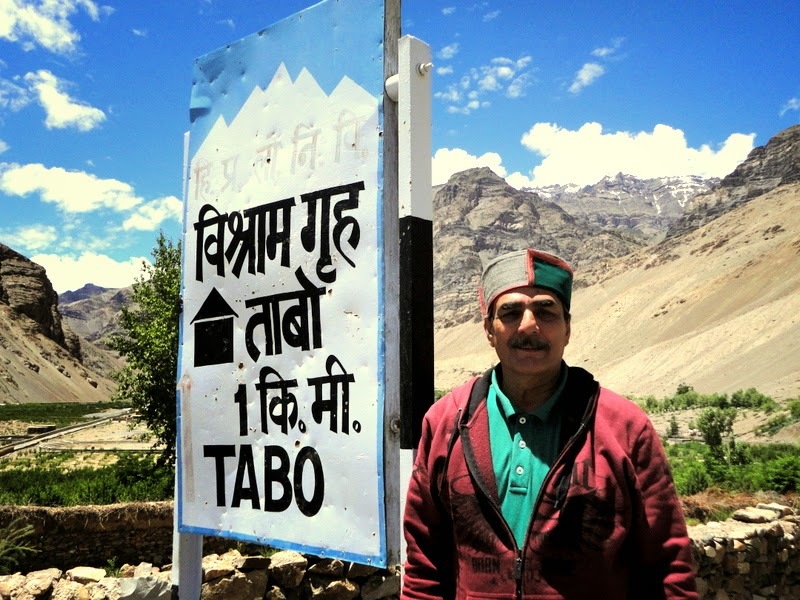 Here once again we met the Holland couple whom we had met at Kalpa village. Generally Tourists take a break here for the night stay. 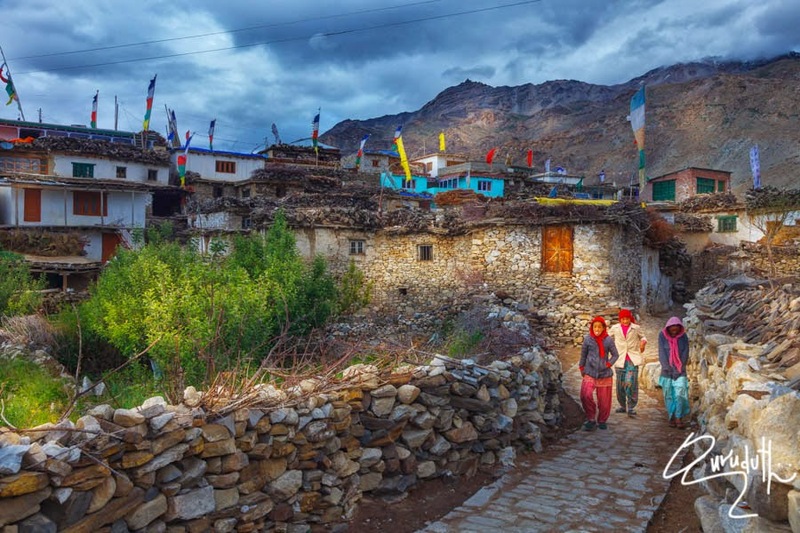 Now there are many hotels and guest houses in this village, some of them are constructed in old traditional way with local materials, they are popularly known as Home stay. 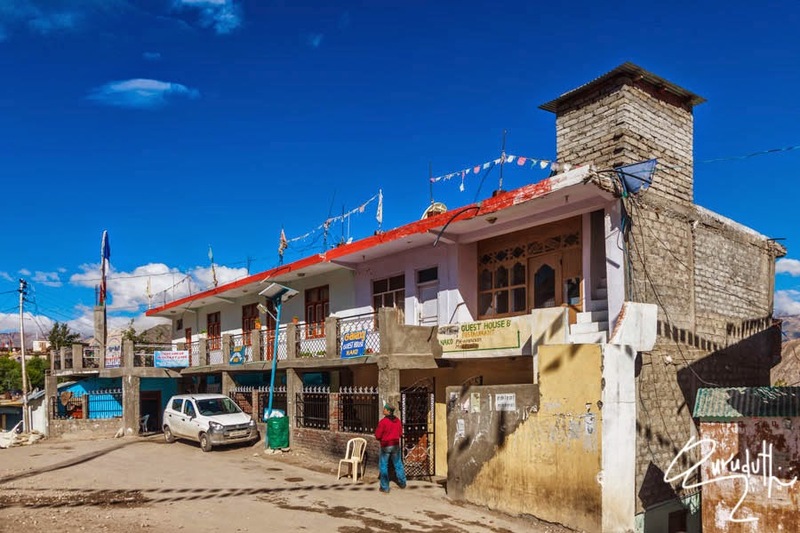 During Off seasons, tariffs of these home stay guest houses are less and available at a range of from Rs 600 /- onwards, per day. 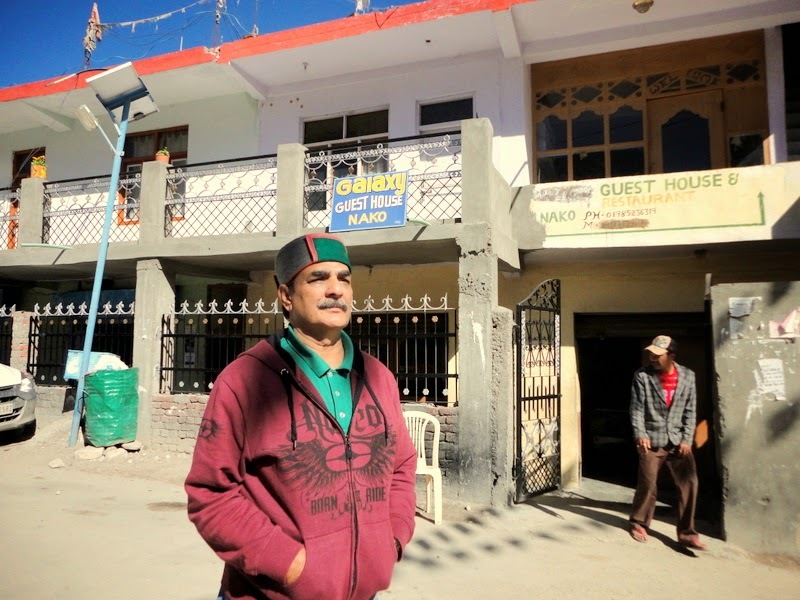 Normal guest houses are available at a price of Rs 650/- . Extra bed are at a range of INR 100 to 150/-. Room rent may vary. Tourist luxurious tents are available at a price of INR 1500/- per day. These tents are promoted on Eco tourism concept. Tents are having all basic facilities with attached toilet but without TV facility. In Nako even good hotels do not have TV facility inside rooms. During the Dinner we met a lady whose name was Neeru, a Taiwanese national who was a doctor by profession and was travelling all alone from Srinagar via Leh Ladakh. We shared our experiences with each others and her next destination was Kalpa (she pronounced it in a funny squeaky and nasal way as KAPPA). It was nice talking to her. The temperature at night was very cold and water leakage from our bathroom made our room even colder. The mobile connection gets very feeble here. Airtel does not connect at all and BSNL has a very weak signal. Even the STD booths have difficulty in connecting the lines. 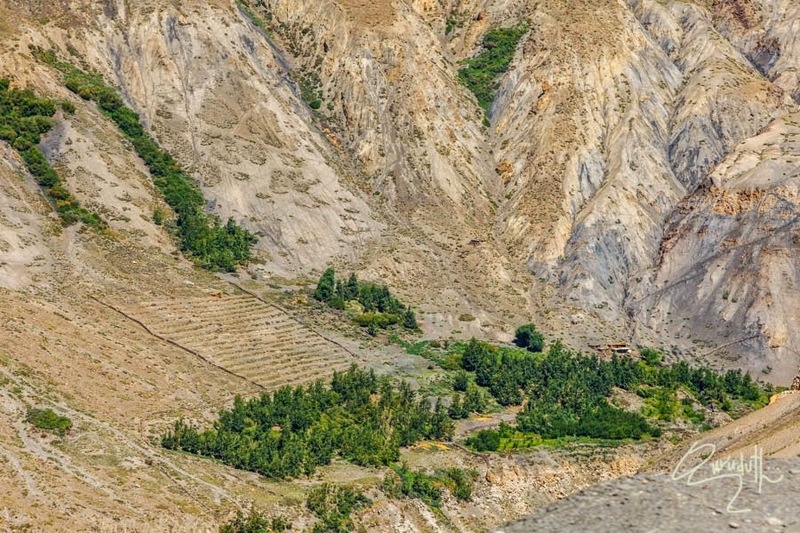 Nako is a village located in Kinnaur district. 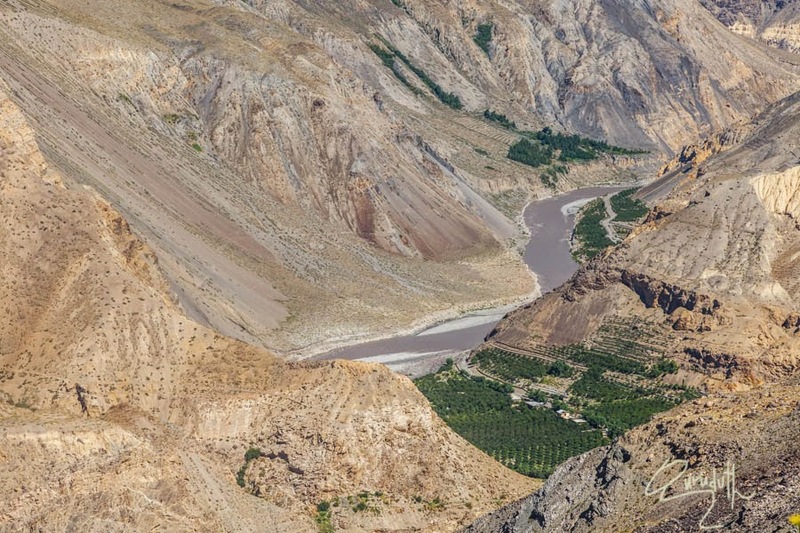 The area is known for its lake,”Nako Lake” which forms part of the border of the village. 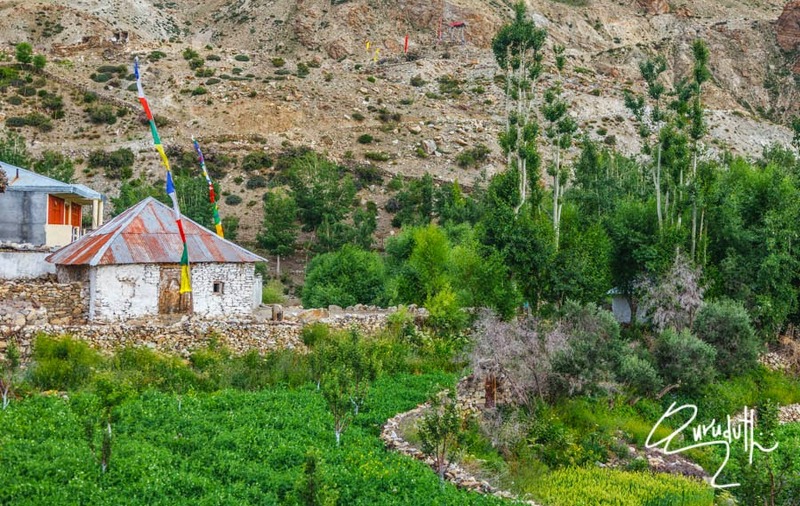 Nako Monastery is located in the center of the Nako village. it receives tourists during the summer months only. Nako Lake is a high altitude lake. 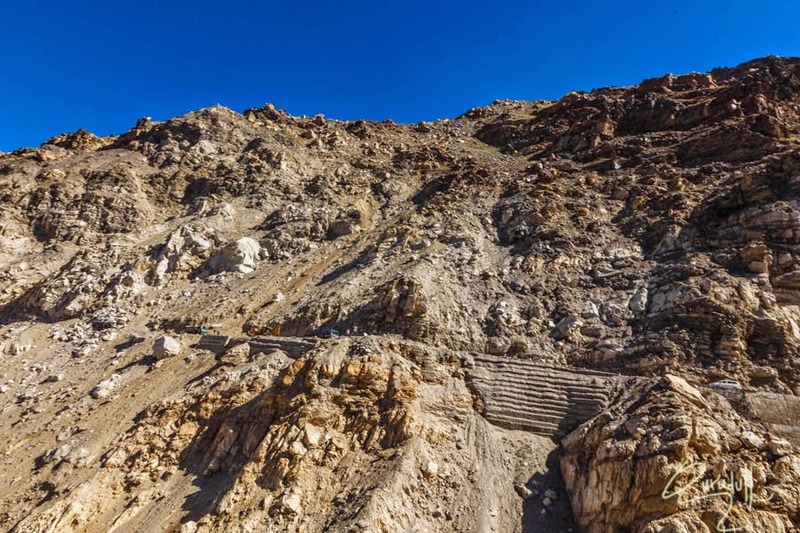 It forms the part of the boundary of Nako village and seems that the village is half buried in the lake's border. 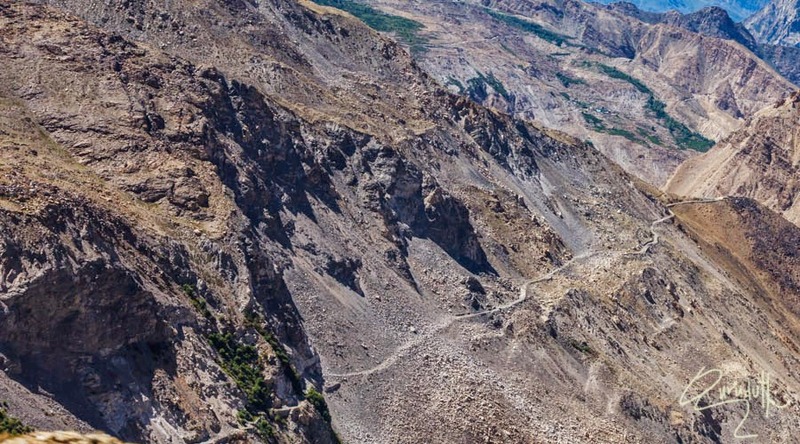 It is about 3,662 metres (12,014 ft) above sea level. The lake is surrounded by willow and poplar trees. Near the lake there are four Buddhist temples. 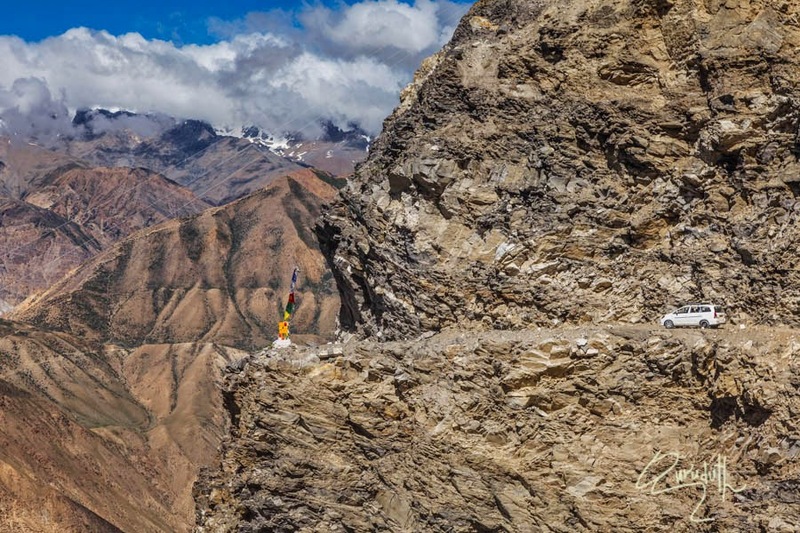 Near this place there is a foot like impression ascribed to the saint “Padmasambhava”. 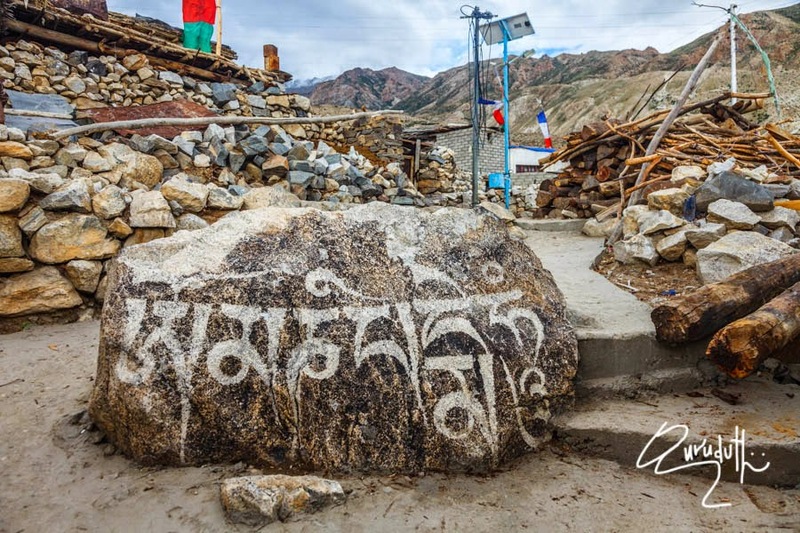 Several miles away there is a village called Tashigang around which there are several caves where it is believed that Guru Padmasambhava meditated and gave discourse to followers. There is a waterfall nearby which has snow water falling like a river of milk. Legend says that it is a heavenly realm of fairies. In one of the caves you are still able to see the live footprints of these fairies or other demigods. It is a sacred place for the people of these valleys. 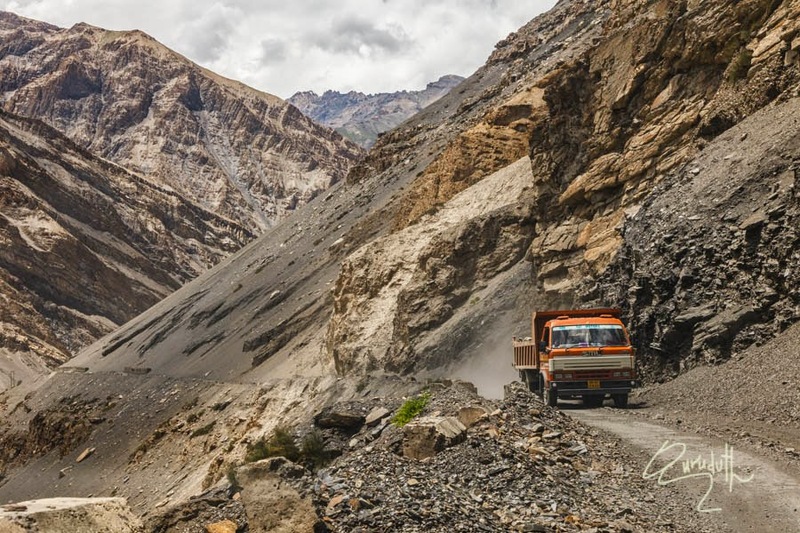 Followers come from as far a place as Ladakh and spiti valley. 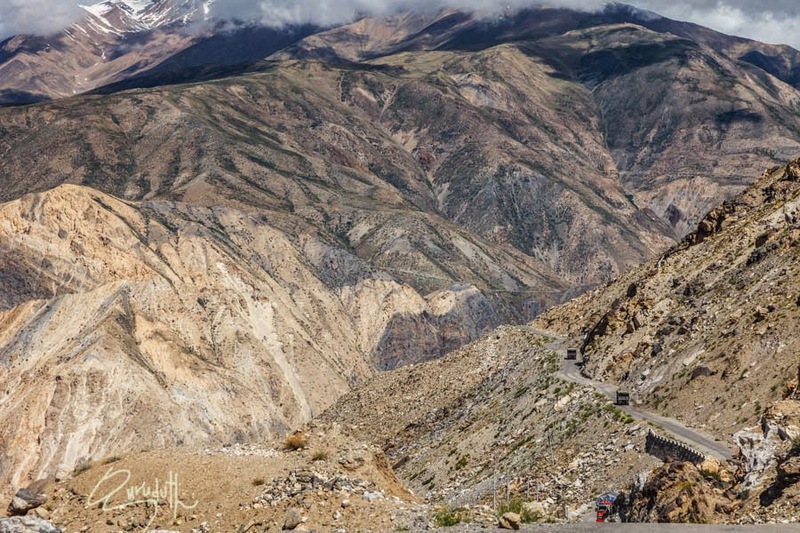 Day (7)—22nd July 2014---Our today’s Journey would be from Nako to kaza town. 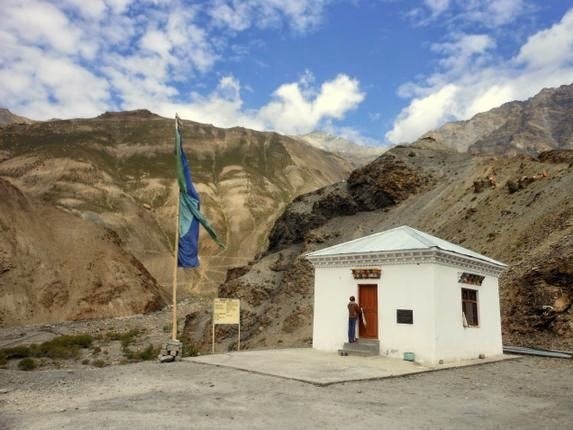 For the coming night we would be stopping at Kaza town. Since all night long, it had been raining. 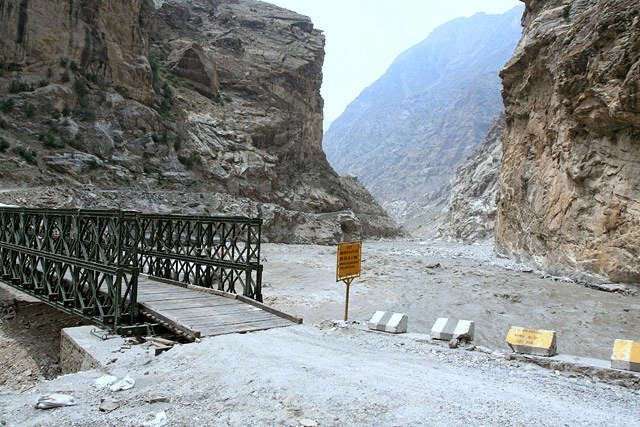 Just to avoid road blocks due to continuous landslides, From Nako we started our journey early in the morning (at 6.00 AM) hoping that we could easly clear the Malling stretch. 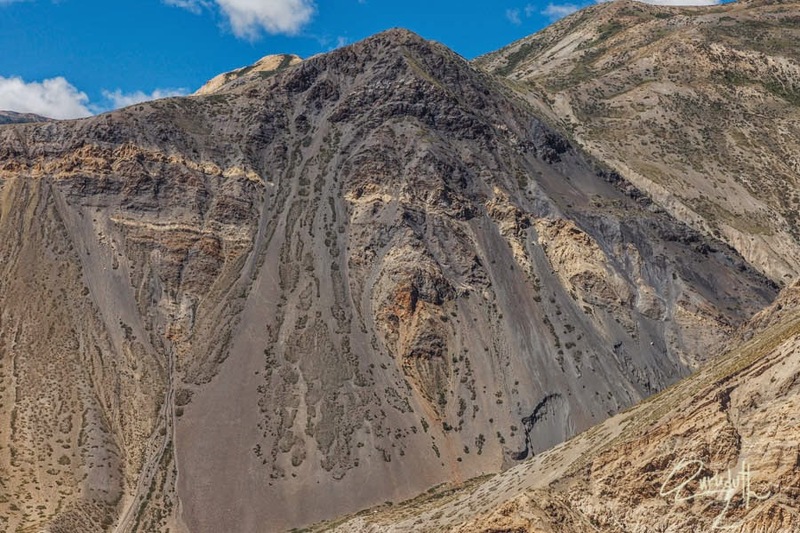 The whole stretch of about 10 Km of Malling range is actually Prone area for plenty of Landslides. 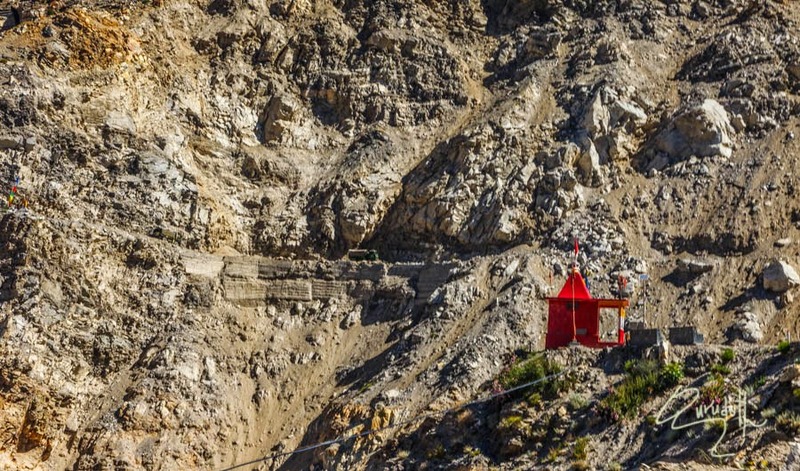 At one of the most narrowest stretch of this dangerous Malling road, there is a permanent small temple structure of the “Goddess DEVI”, which is constructed by (BRO), where all most all the travelers before venturing out on this dangerously fatal road, pray for their safety. 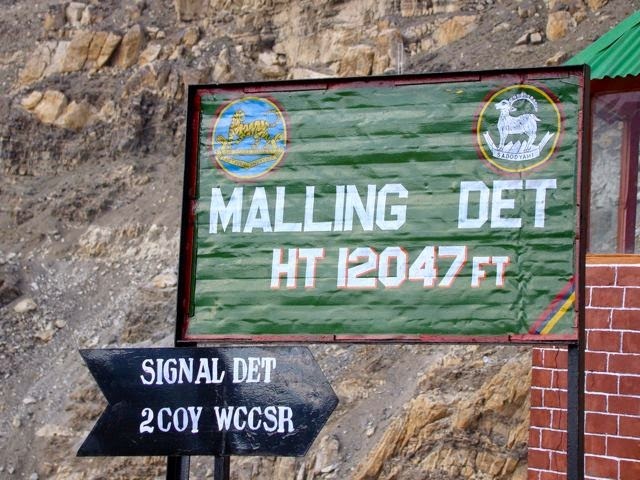 At “Malling” itself there is a permanents base camp of (BRO), (Border Road Organization). The (BRO) has a big manpower permanently camped here. 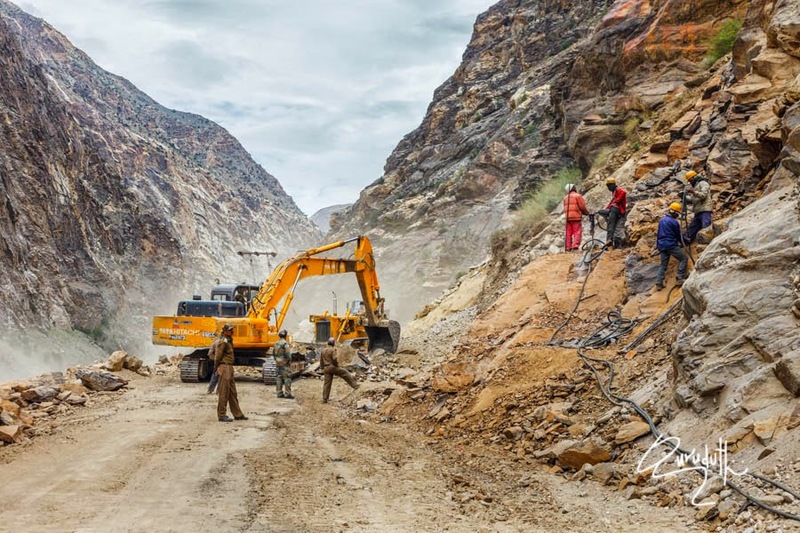 They are fully trained workforce of (BRO) and are equipted with heavy machinery too, to maintain the highway. (BRO) works nonstop throughout the day right from 8 AM to late evening. 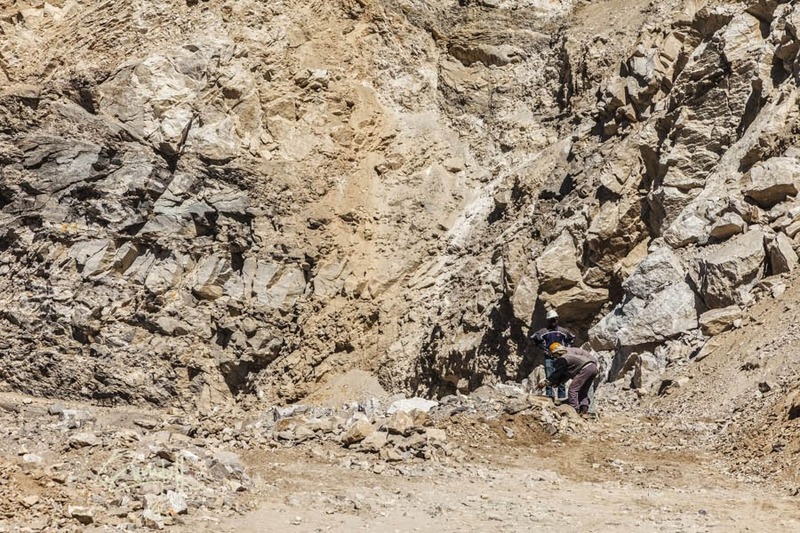 The whole stretch of “Malling” is landslide prone area. 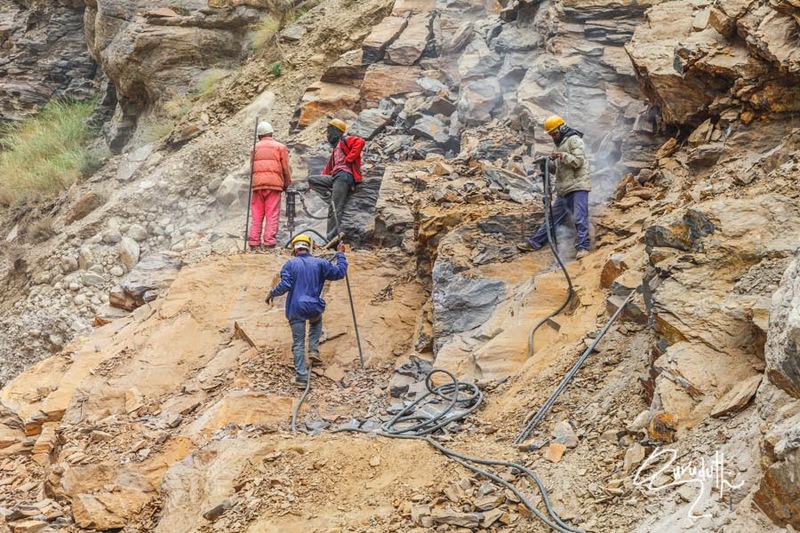 There are many areas where continuously shooting rocks keep rumbling down which invariably brings down tonnes of mud slush too. Seeing these Photographs, you yourself can judge how dangerous Malling’s accident prone road stretch is ? Early morning at about 6:30 AM when we reached at the beginning of Malling's Landslide area, a portion of the road was blocked due a huge landslide, that would have been caused during the last night’s nonstop rain. 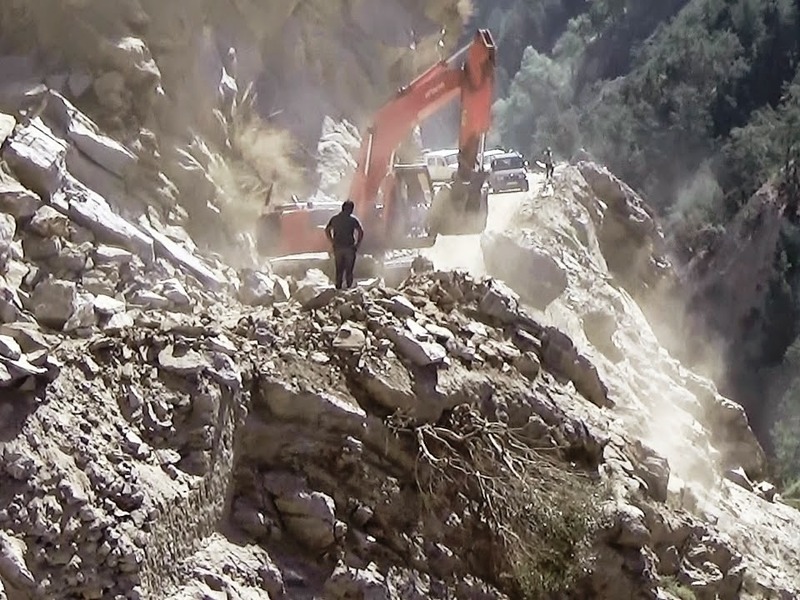 We were shocked to see the amounts of Mud and huge rocks that had blocked the road. Since it was very cold in the early morning, (BRO) manpower hadn't come to work. 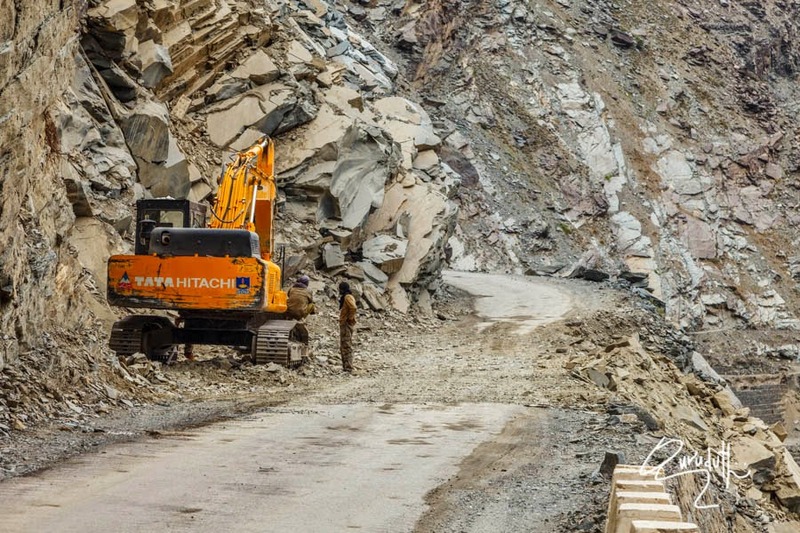 Gurudatt got down from the car to inspecting the colossal damage caused by the landslide. 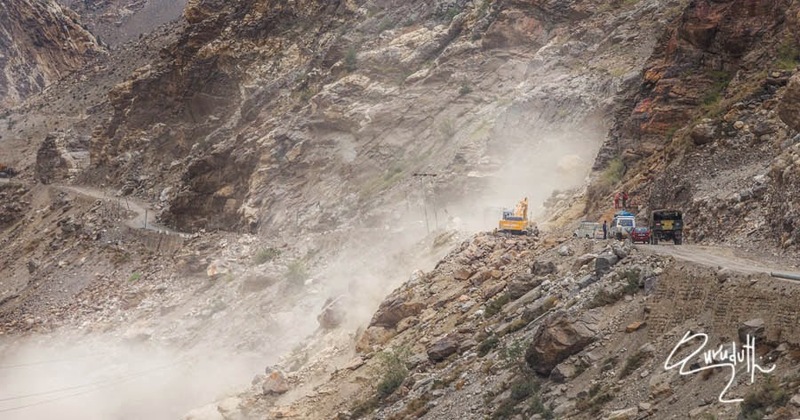 After inspecting unbelievable size of the landslide, Gurudatt suggested that we should go back to Nako town till the (BRO) start's clearing the boulders and the road. 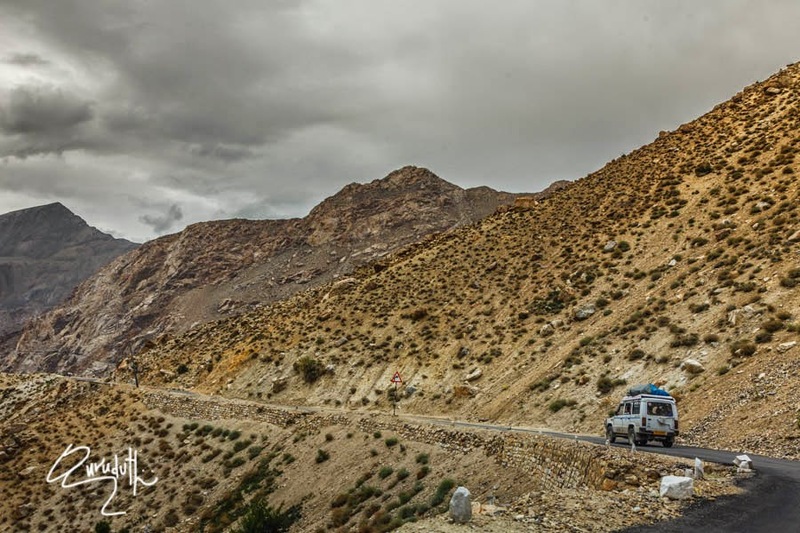 While driving back to Nako, on our way at the base camp of (BRO), Gurudatt got down from our car and went into the camp to informed them about the road block. Then one of the men of (BRO) suggested us that we should come back only after 10AM, by then they would clear the bad stretch of the road. We came back to the same hotel and slept till 10 AM. By the time we came back to the spot of road block, (BRO) were still managing with manpower and heavy machinery to clear the road. 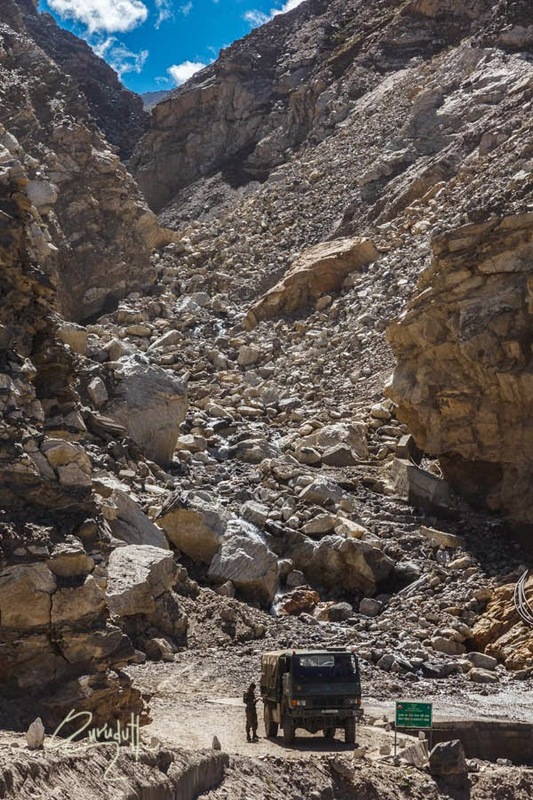 After clearing big boulders, big vehicles were allowed to go first, where as we were asked to stop, because our small car ALTO, which has lesser bottom clearance from the road. It was amazing experience to see that while (BRO) men were working, many stray shooting stones were still continuously shooting down. Then finally after half an hour’s wait, we were allowed to proceed. We thanked the (BRO) team and proceeded onwards to our further journey. 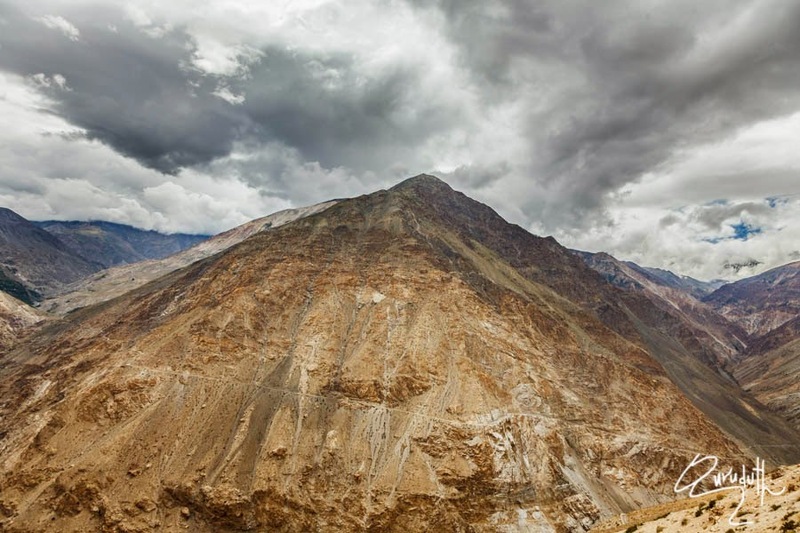 which is situated at an altitude of (7,125ft) above MSL. 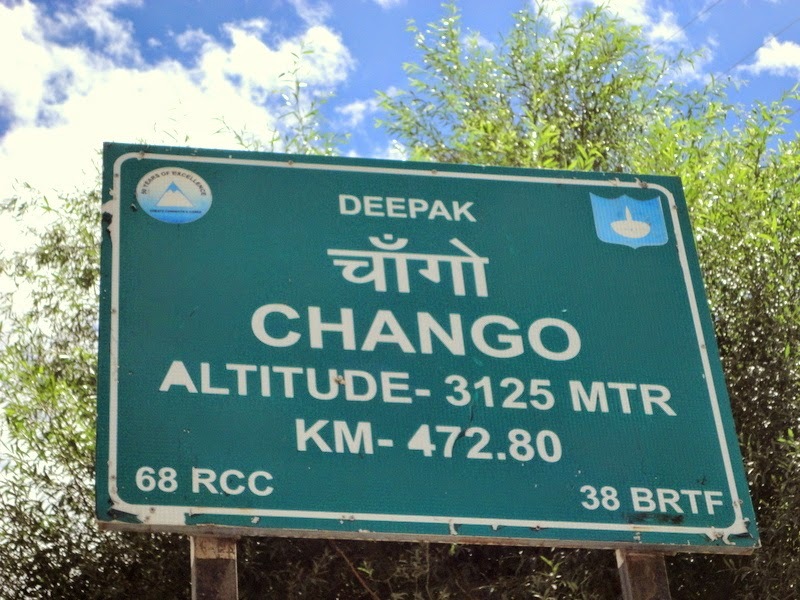 At a distance of another 13 Km from “Chango” comes “Sumdo” village. 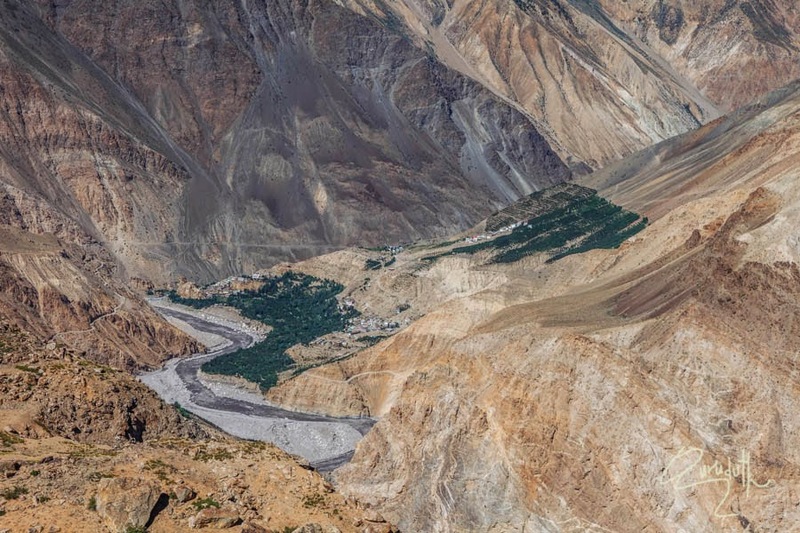 Here at “Sumdo” a little away from the RCC connecting bridge, the rivers “Parchu which runs from Tibet and Spiti” join here. 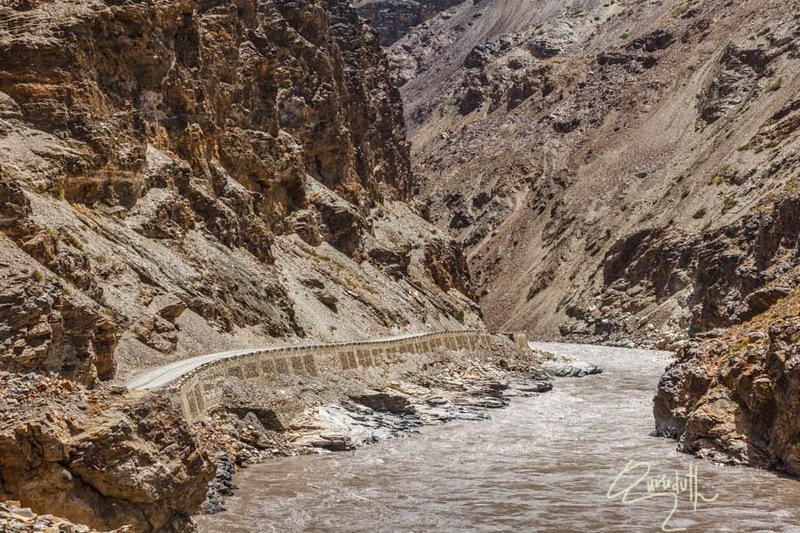 Just aside the border walls of China, there lay another cold desert of India alike Ladakh, known as “Spiti Valley”. 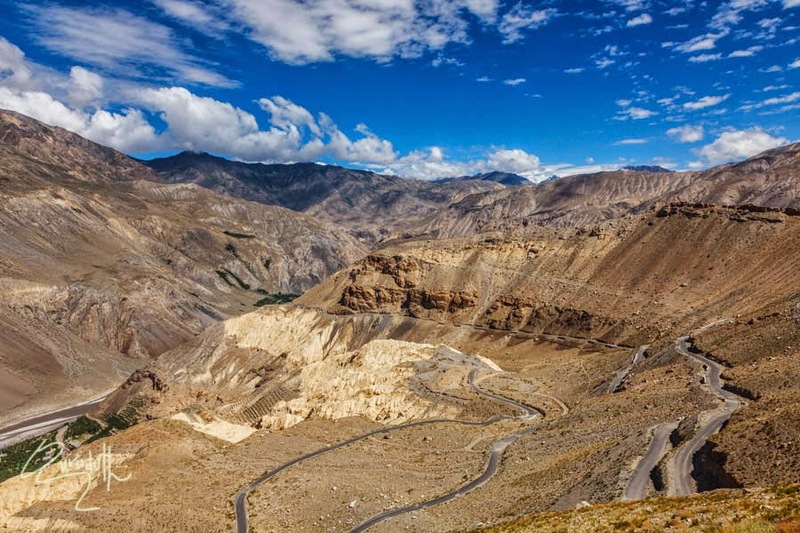 The breathtaking views, panoramic vistas and magical multi-colours mountains of this barren land makes it almost identical to Ladakh and at times even more beautiful. 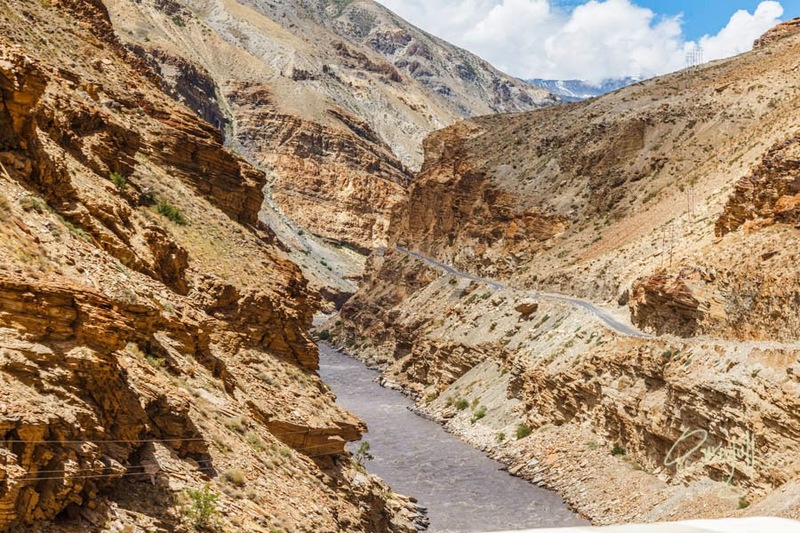 Such traits of Spiti Valley make it another place after Ladakh from where only body comes back and soul’s keeps wandering somewhere there. 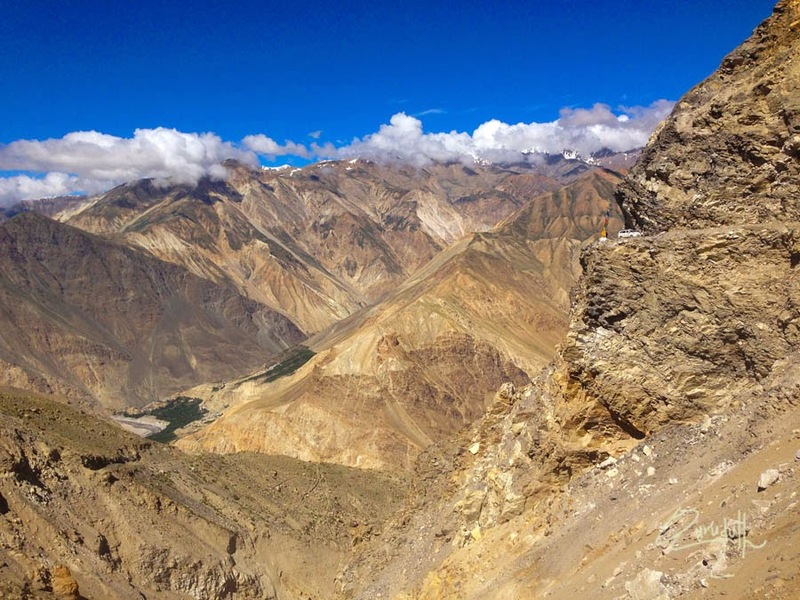 The district of “Lahaul-Spiti” consists of the two formerly separate districts of “Lahaul” and “Spiti”. 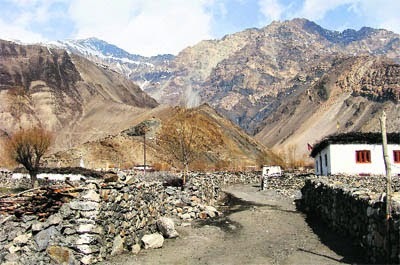 The present administrative centre is “Keylong” in “Lahaul”. 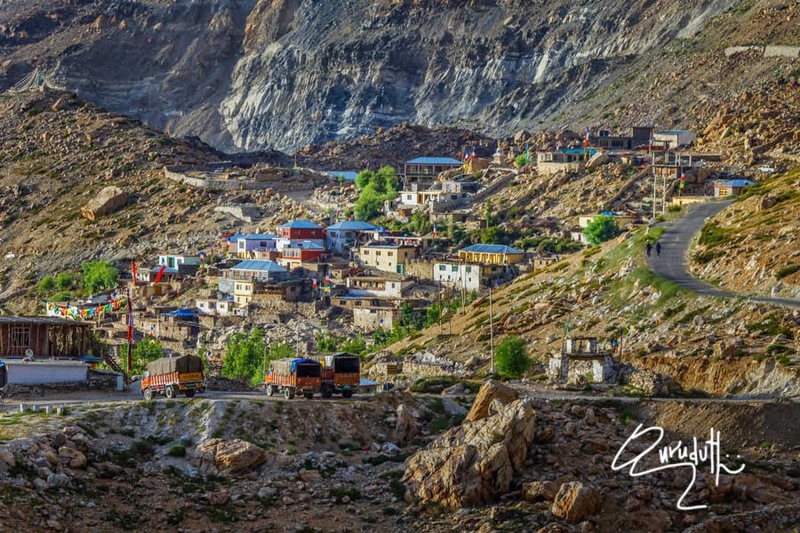 Before the two districts were merged, “Kardang” was the capital of “Lahaul” and “Dhankar” the capital of “Spiti”. The district was formed in 1960. 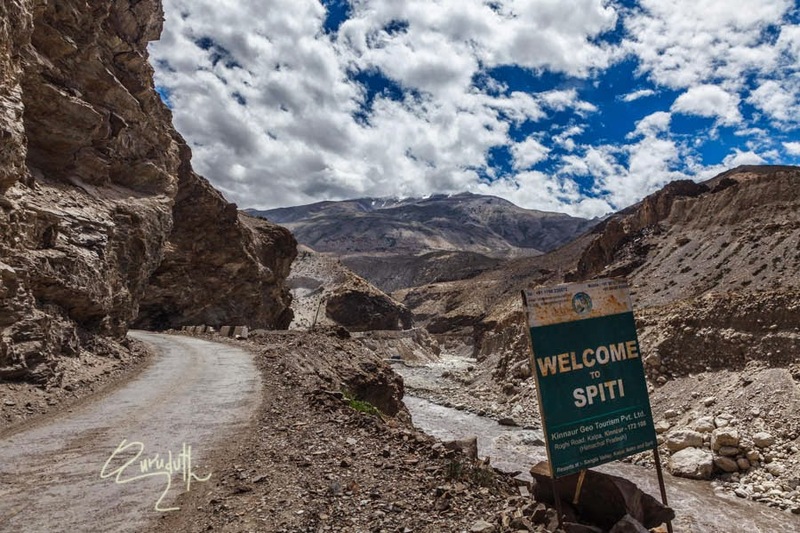 In whole of the “Spiti” region it doesn’t rain, that’s why it is called as a high altitude or cold desert having close similarities to the neighboring “Tibet” and “Ladakh” regions in terms of terrain. 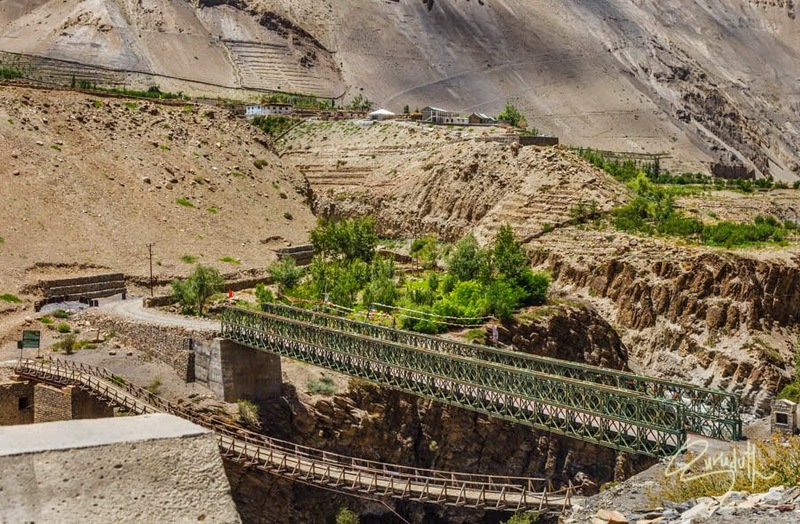 The harsh conditions of Lahaul and Spiti permit only scattered tufts of hardy grasses and shrubs to grow, even below 4,000 metres. 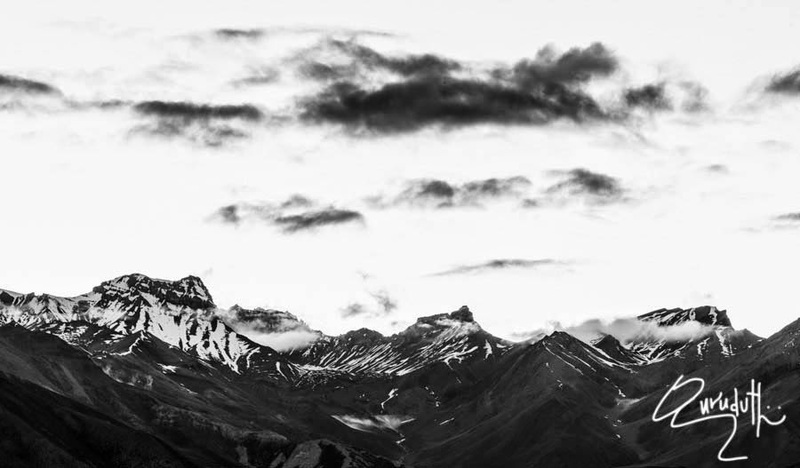 Glacier lines are usually found at 5,000 metres. 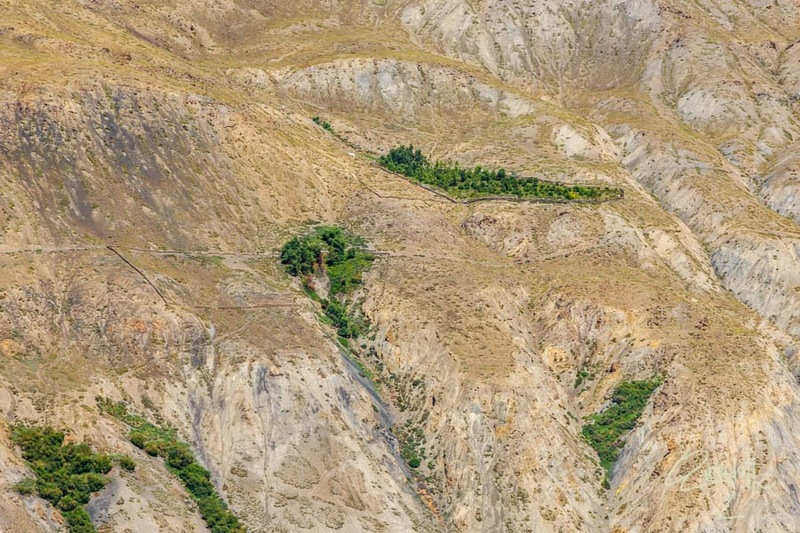 Animals such as Yaks and Dzos roam across the wild Lingti plains. 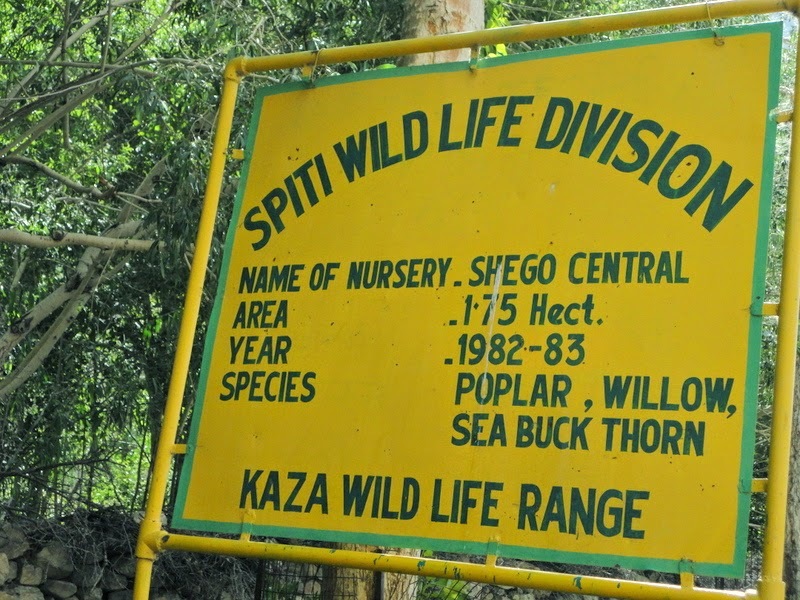 However, over-hunting and a decrease in food supplies has led to a large decrease in the population of the Tibetan antelopes, Argali, Kiangs, Musk Deer, and Snow Leopards in these regions, reducing them to the status of endangered species. 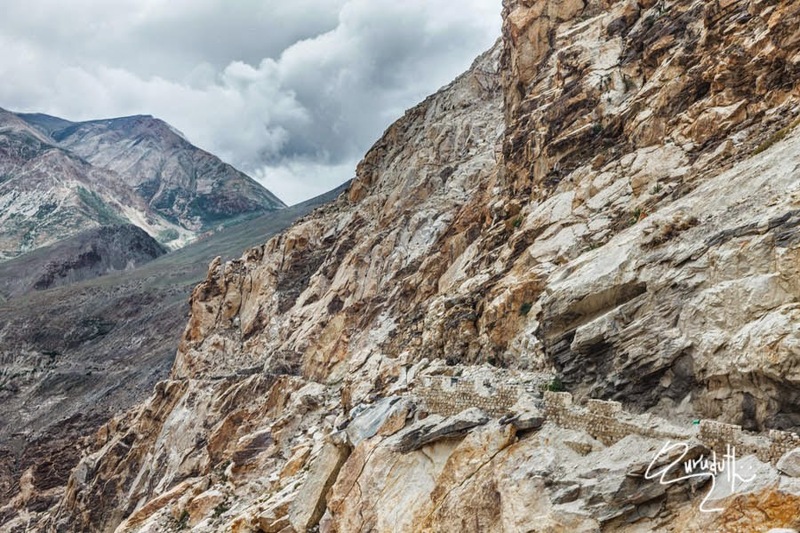 However, in the Lahaul valley, one can see Ibex, Brown Bears, Foxes and Snow Leopards during winter. 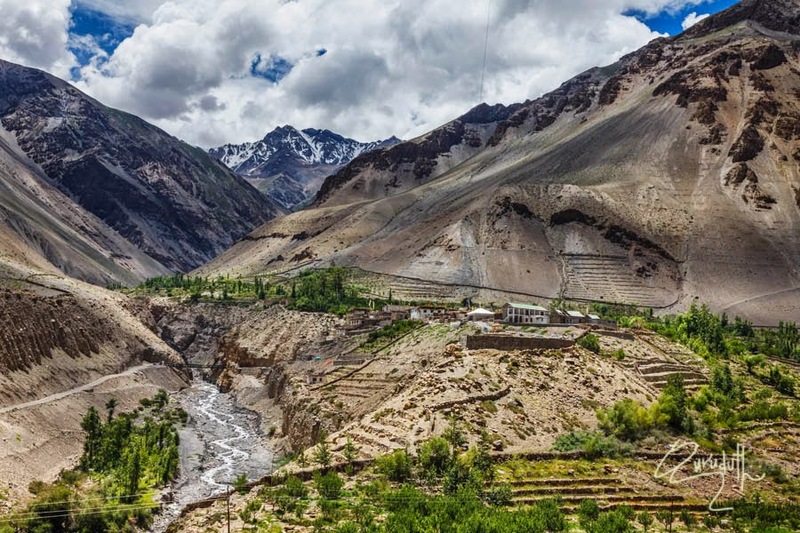 The language, culture, and populations of Lahaul and Spiti are closely related. 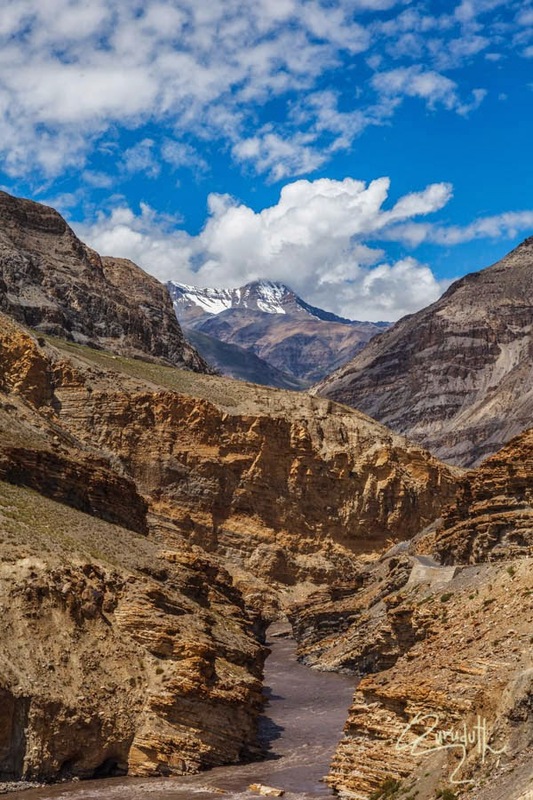 Generally the Lahaulis are of Tibetan and Indo-Aryan descent, while the Spiti Bhotia are more similar to the Tibetans, owing to their proximity to Tibet. 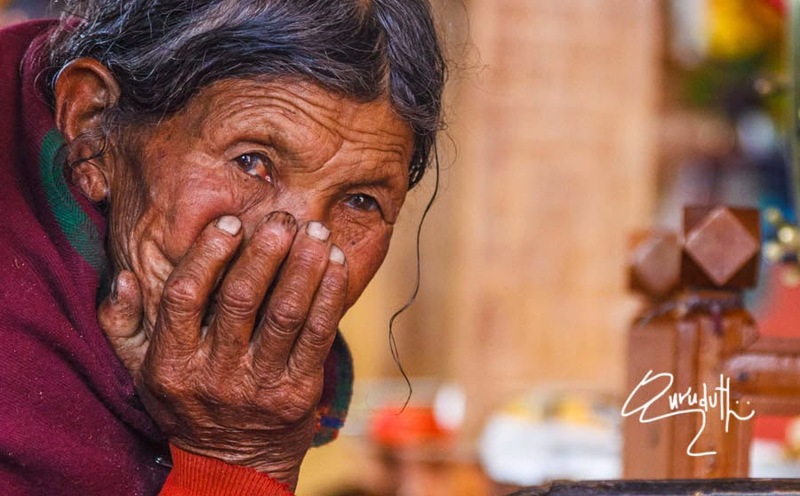 Fairer skin and hazel-colored eyes are commonly seen among the Lahaulis. 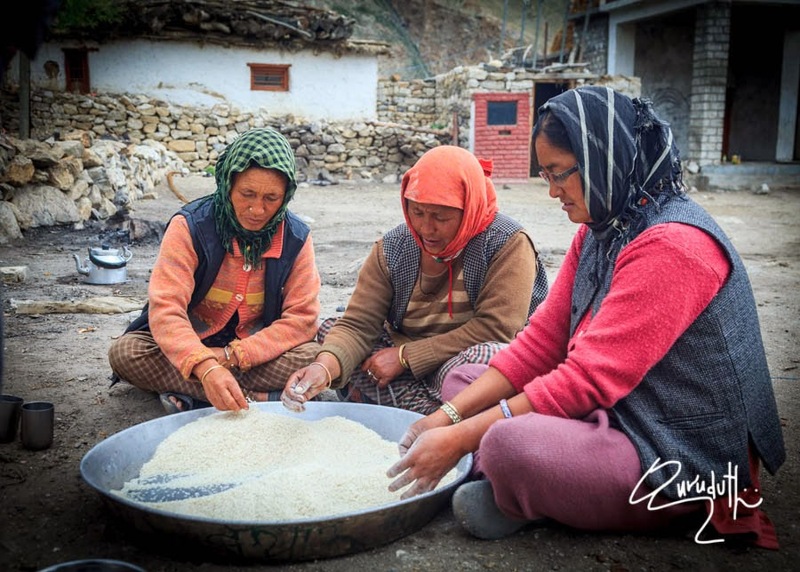 The languages of both the Lahauli and Spiti Bhutia belong to the Tibetan family. 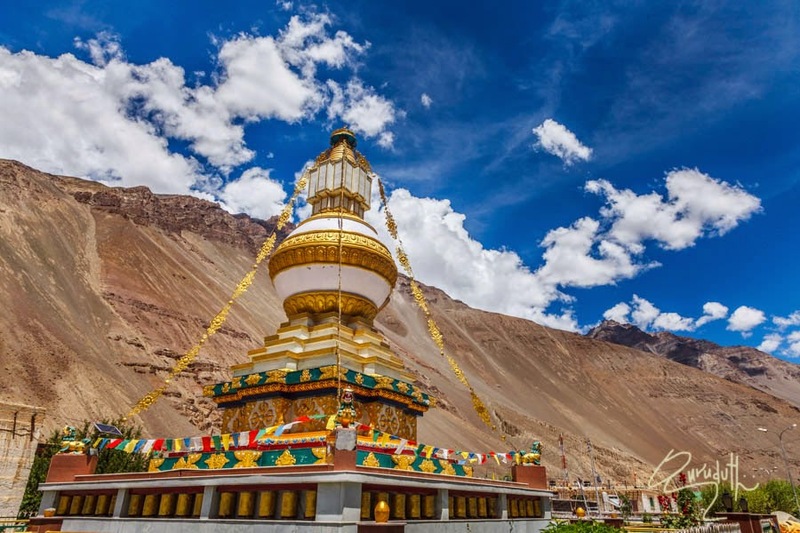 They are very similar to the Ladakhi and Tibetans culturally, as they had been placed under the rule of the Guge and Ladakh kingdoms at occasional intervals. 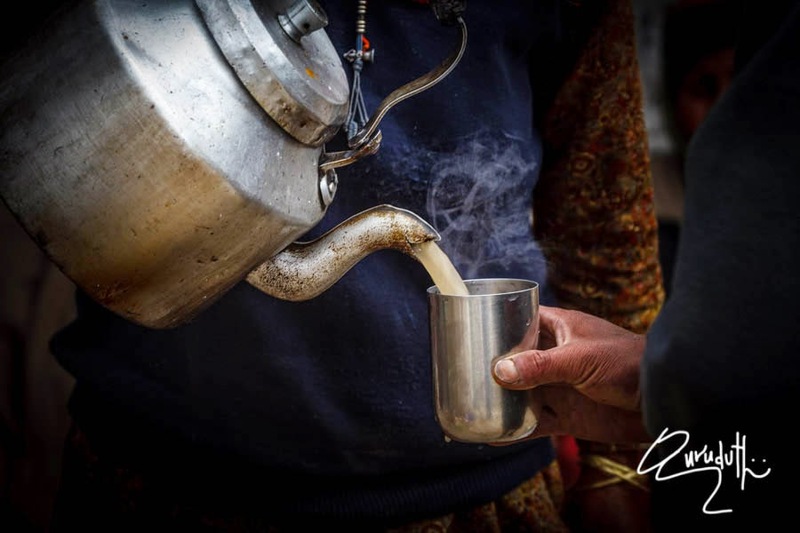 Among the Lahaulis, the family acts as the basic unit of kinship. The extended family system is common, evolved from the polyandric system of the past. 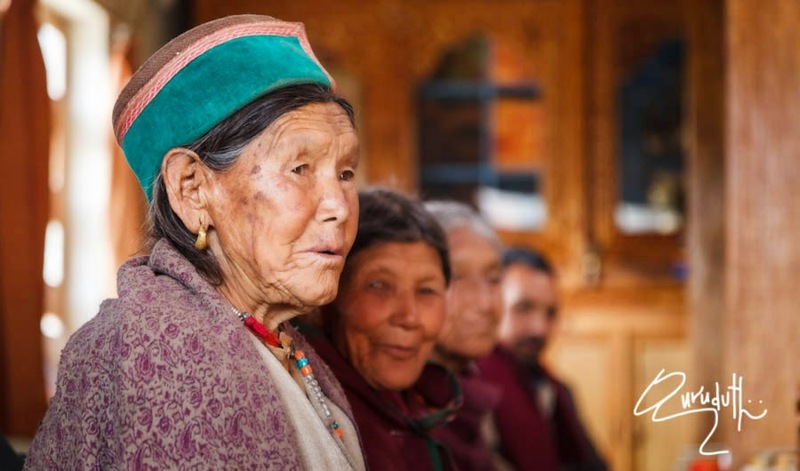 The family is headed by a senior male member, known as the Yunda, while his wife, known as the Yundamo, attains authority by being the oldest member in the generation. The clan system, also known as Rhus, plays another major role in the Lahauli society. 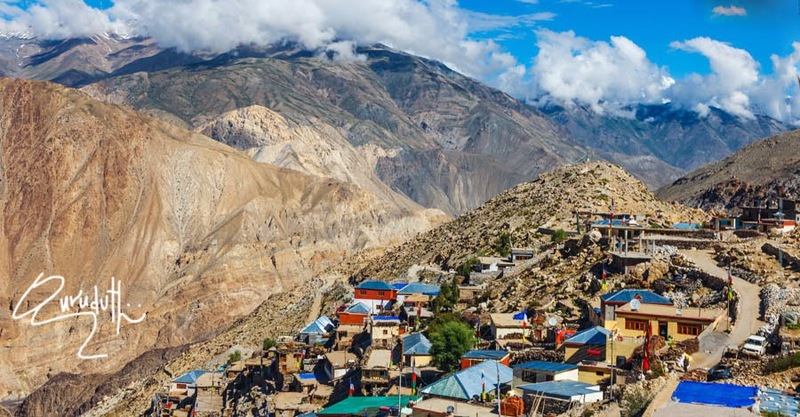 The Spiti Bhutia community has an inheritance system that is otherwise unique to the Tibetans. Upon the death of both parents, only the eldest son will inherit the family property, while the eldest daughter inherits the mother's jewellery, and the younger siblings inherit nothing. 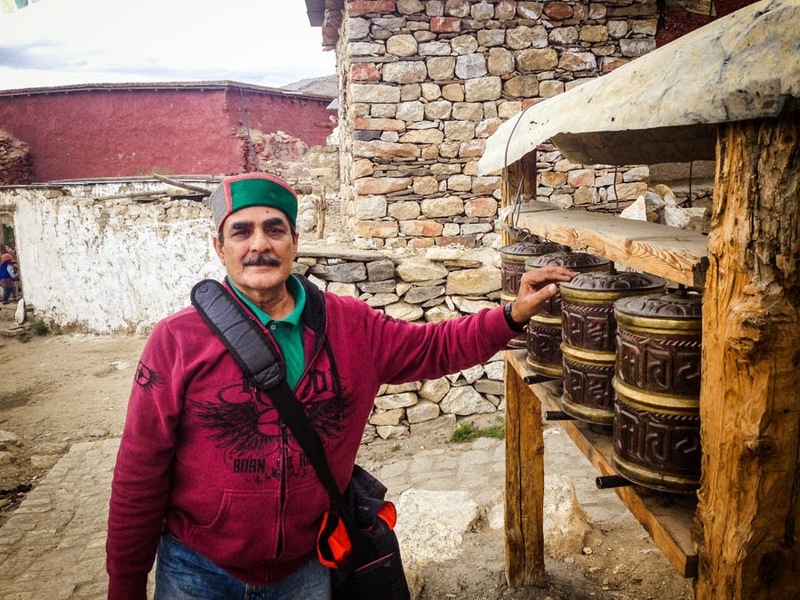 Men usually fall back on the social security system of the “Trans-Himalayan Gopmas”. 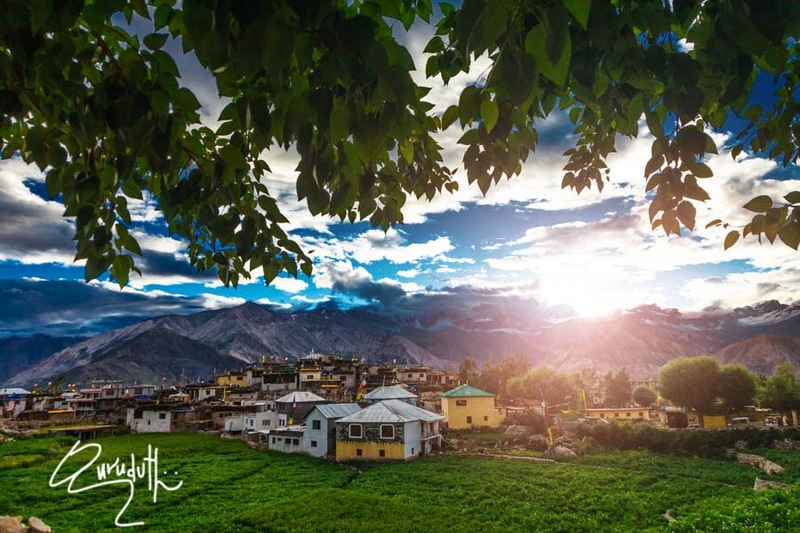 The lifestyles of the Lahauli and Spiti Bhotia are similar, owing to their proximity. Polyandry was widely practiced by the Lahaulis in the past, although this practice has been dying out. 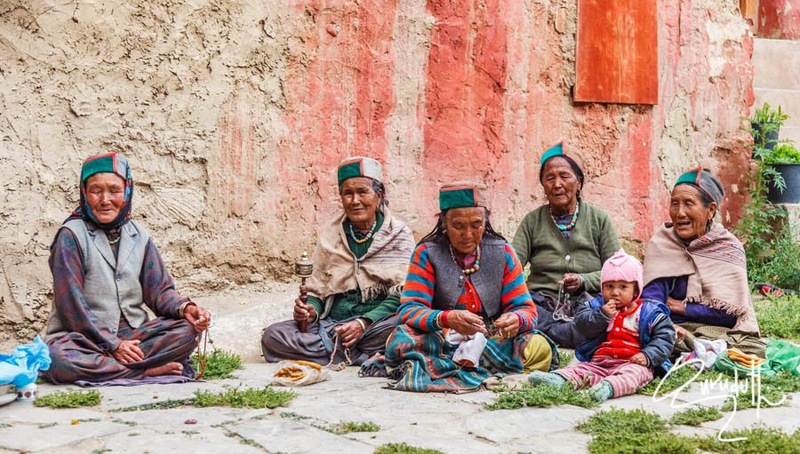 The Spiti Bhutia do not generally practice polyandry any more, although it is accepted in a few isolated regions. 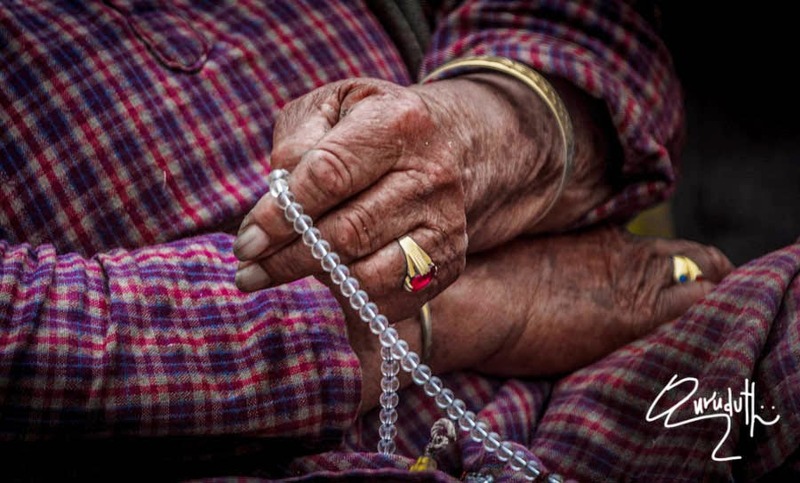 Divorces are accomplished by a simple ceremony performed in the presence of village elders. Divorce can be sought by either partner. The husband has to pay compensation to his ex-wife if she does not remarry. However, this is uncommon among the Lahaulis. 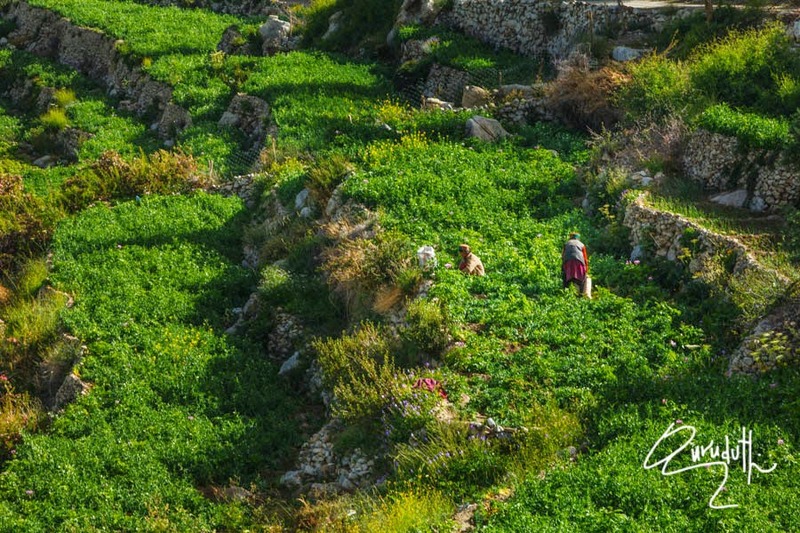 Agriculture is the main source of livelihood. Potato farming is common. Occupations include animal husbandry, working in government programs, government services, and other businesses and crafts that include weaving. 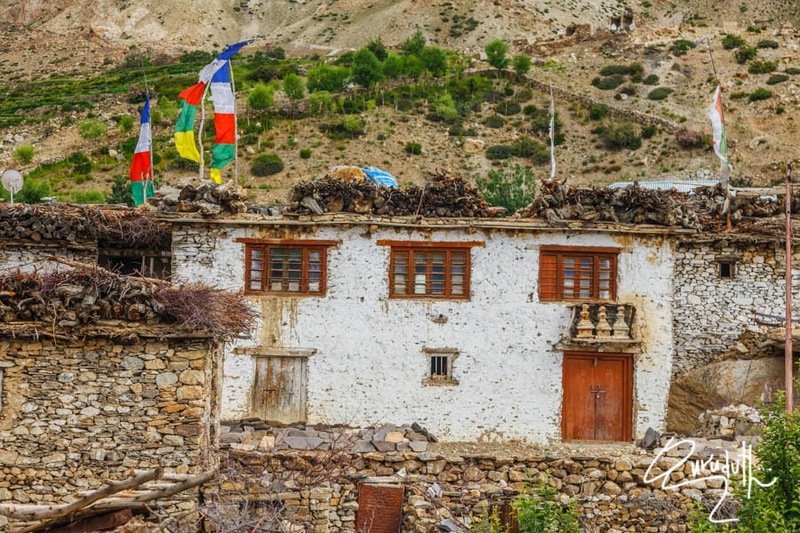 Houses are constructed in the Tibetan architectural style, as the land in Lahul and Spiti is mountainous and quite prone to earthquakes. 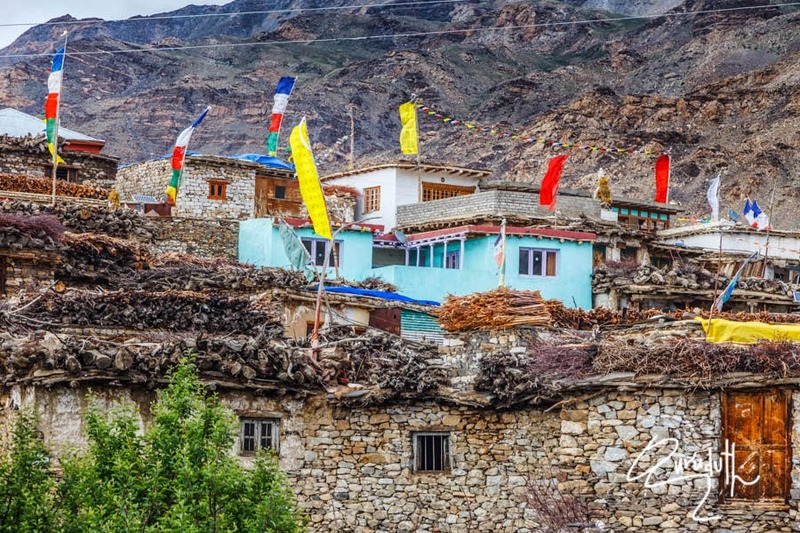 Most of the Lahaulis follow a combination of Hinduism and Tibetan of the Durkpa Kagyu order, while the Spiti Bhotia follow Tibetan Buddhism of the Gelugpa order. 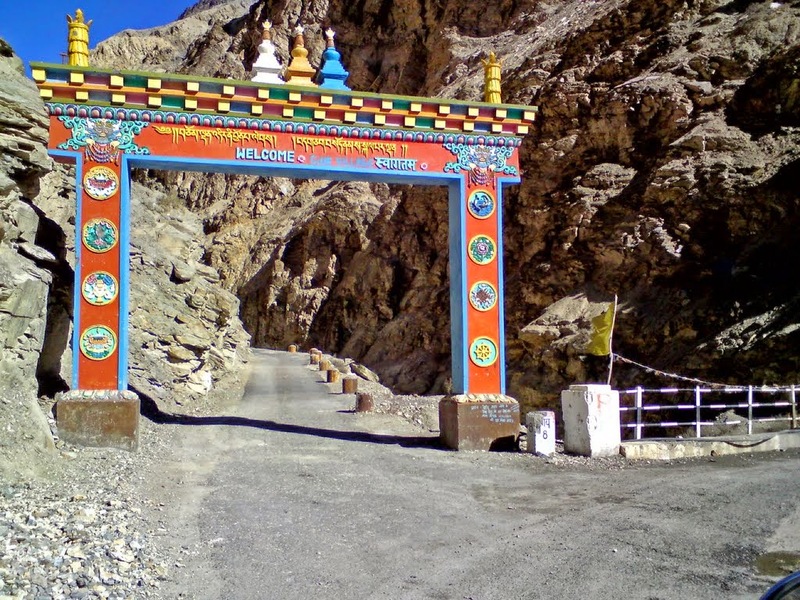 Within Lahoul, the Todh/Gahr (upper region of Lahaul towards Ladhakh) region had the strongest Buddhist influence, owing to its close proximity to Spiti. 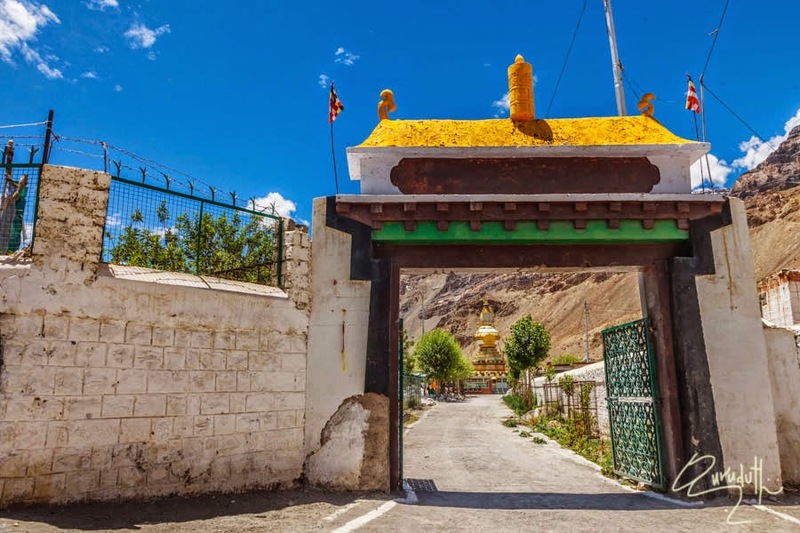 Lahoul has temples such as Trilokinath Temple, where pilgrims worship a certain god in different manifestations, notably in the form of Shiva and Avalokiteshvara where in Udiapur (near Keylong) is a puritan temple. This bas-relief, of marble, depicts the Buddhist deity Avalokiteshvara (the embodiment of the Buddha's compassion) in a stylized seated position; Hindu devotees take it to be Shiva Nataraj, Shiva dancing. This image appears to be of sixteenth century Chamba craftsmanship. 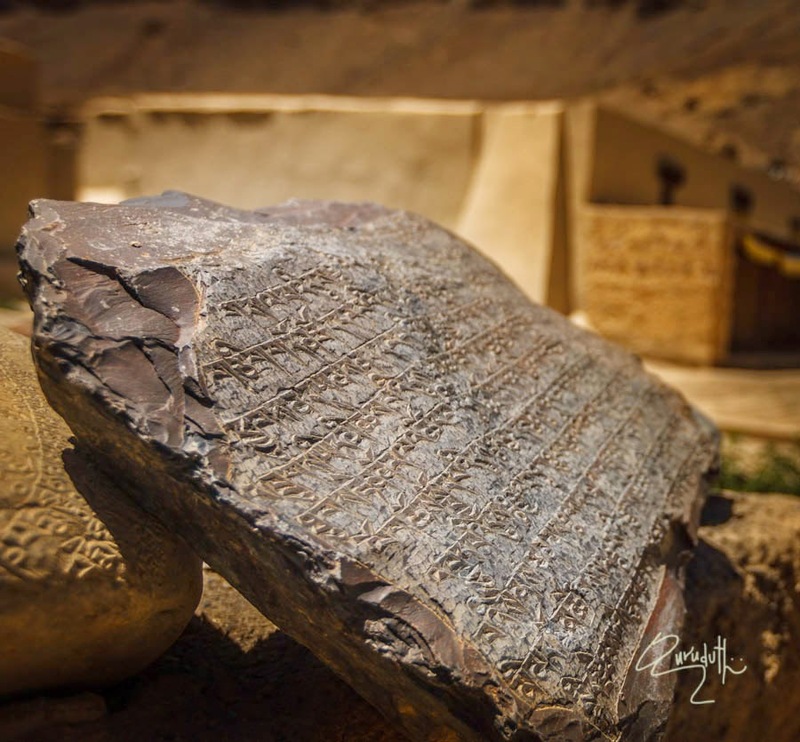 It was created to replace the original black stone image of the deity, which became damaged by art looters. This original image is kept beneath the plinth of the shrine. It appears to be of 12th century Kashmiri provenance . Much of the art thieves are active in this remote belt because of neglected gompas and temples.Raja Ghepan, one of the major deities is greatly workshipped by almost all Lahauli. 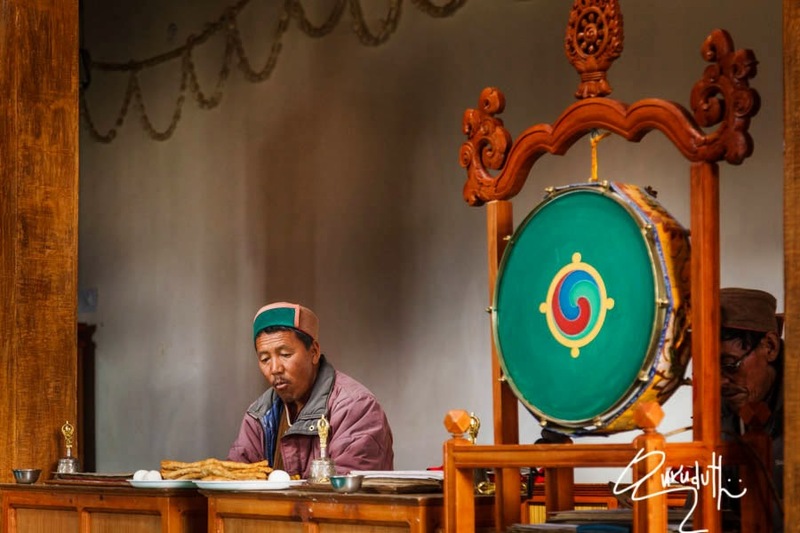 Before the spread of Tibetan Buddhism and Hinduism, the people were adherents of the religion 'Lung Pe Chhoi', an animistic religion that had some affinities with the “Bon” religion of Tibet. While the religion flourished, animal and human sacrifices were regularly offered up to the 'Iha', a term that refers to evil spirits residing in the natural world, notably in the old pencil-cedar trees, rocks and caves. 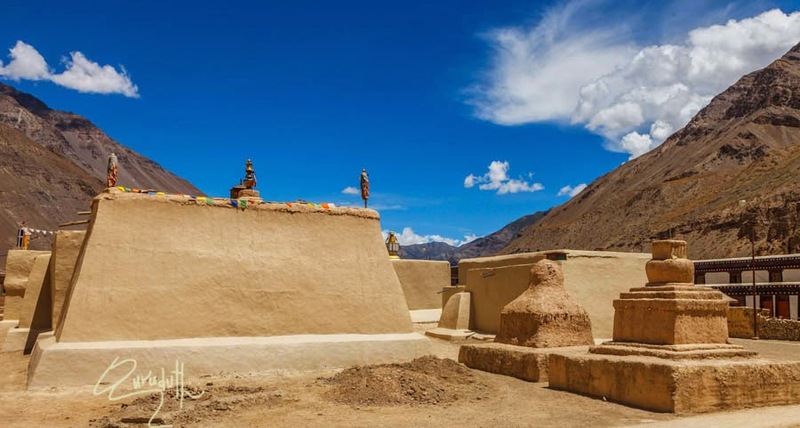 Vestiges of the Lung Pe Chhoi religion can be seen in the behaviour of the Lamas, who are believed to possess certain supernatural powers. 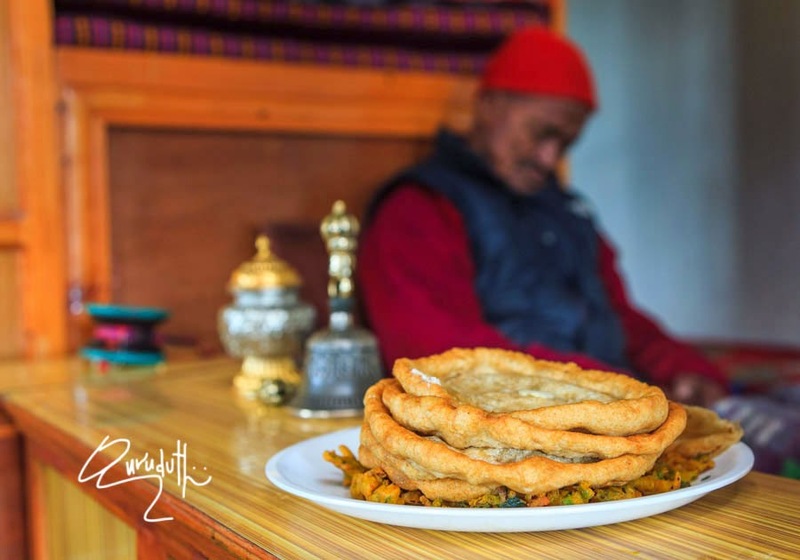 The Losar festival (also known as Halda in Lahauli) is celebrated between the months of January and February. The date of celebration is decided by the Lamas. 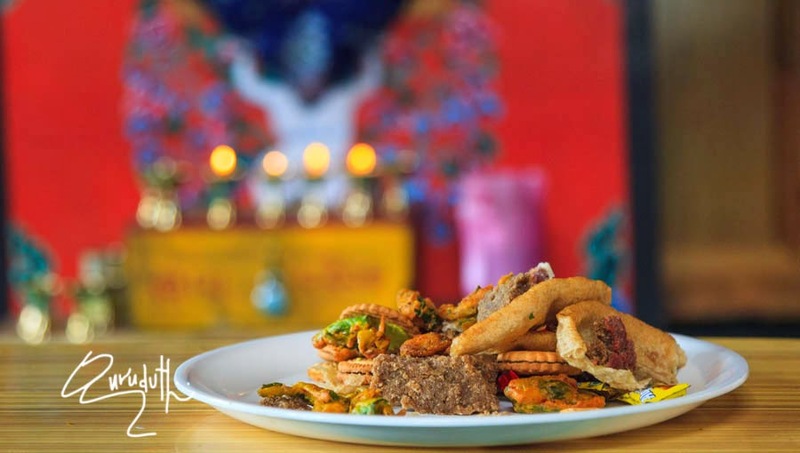 It has the same significance as the Diwali festival of Hinduism, but is celebrated in a Tibetan fashion. At the start of the festival, two or three persons from every household will come holding burning incense. The burning sticks are then piled into a bonfire. The people will then pray to Shikar Apa, the goddess of wealth (other name Vasudhara) in the Buddhist religion. 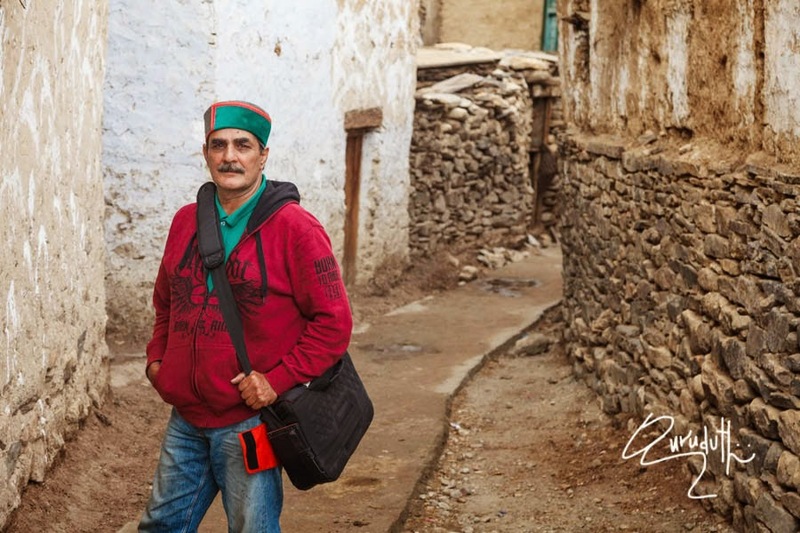 In the Pattan belt of the valley in Lahoul most population follows Hinduism, but counts for 14 percent of the total and they are called swanglas. 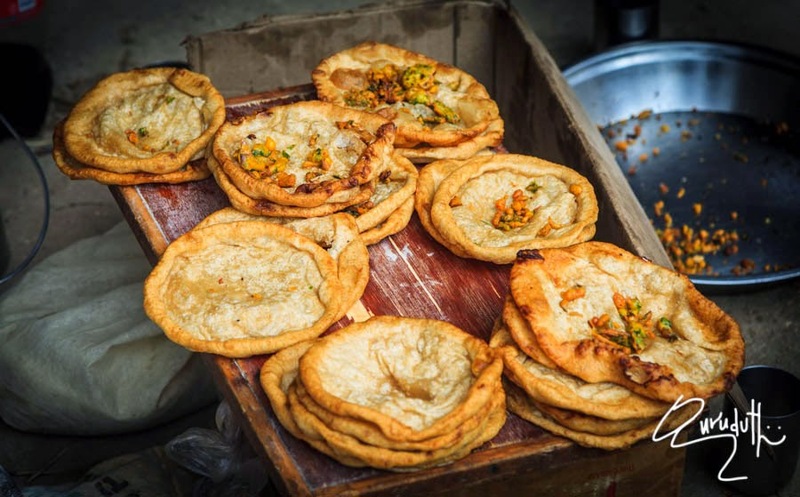 The “FAGLI” festival is celebrated between February and March all over the valley. 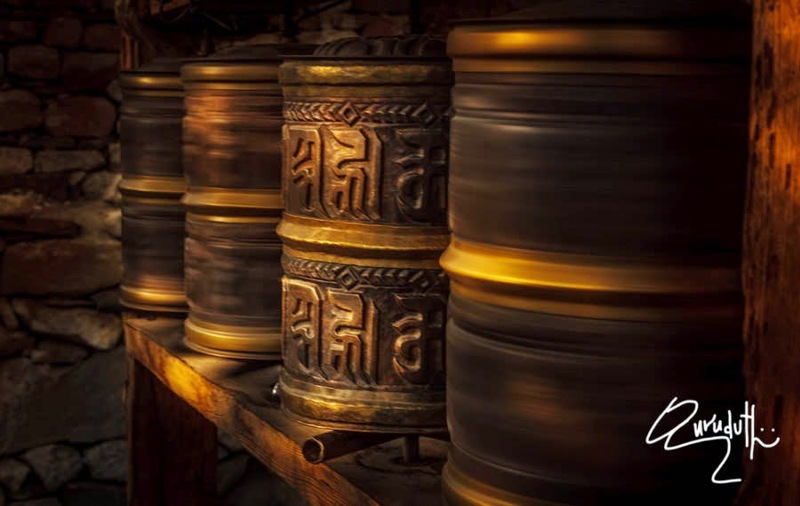 This festival is a new-year festival and closely precedes beginning of Tibetan and Chinese calendar. 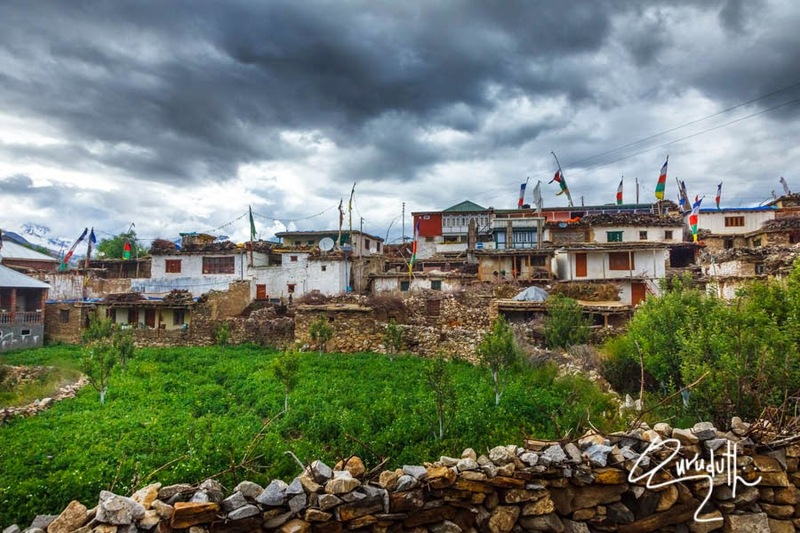 Notable is the Pattan people are the late settlers in the valley around 1500 A.D. and have broad highlights and have distinct language on the likes the central Asians, Chamba, Pangi, Pashtoons and Uyghurs. 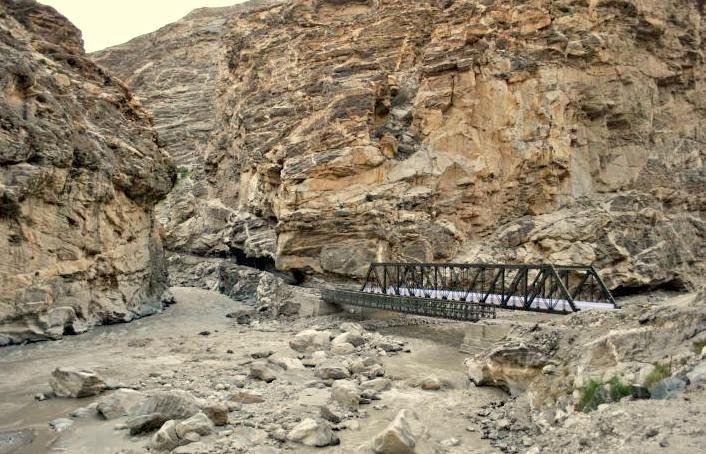 This belt is known for the convergence for Chandra and Bhaga rivers to form Chenab. 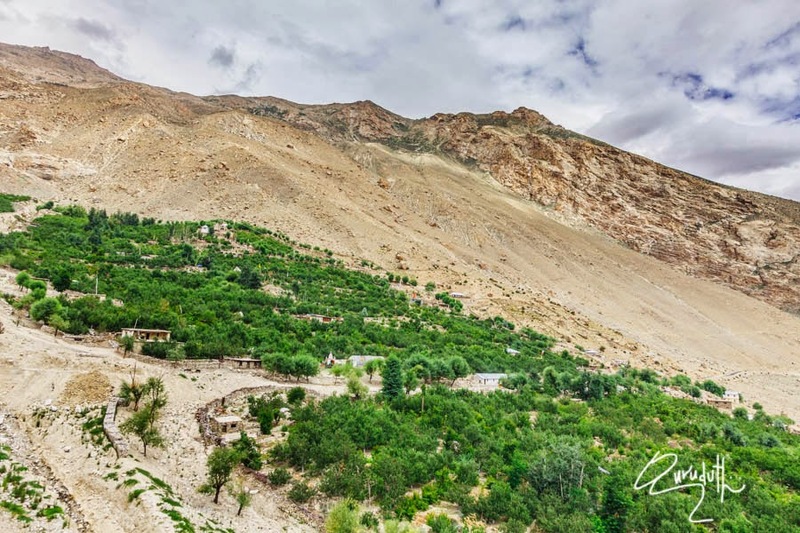 Lahaul has three major valleys like kinnaur, which is Tinan Valley ( Koksar-Dalang), Pattan Valley (Mooling-Uadaipur region), Punan or Todh/Gahr(Keylong-Zanskar). People of Pattan Valley are largely Hindu and each village has its presiding deity. The inhabitants of Tinan Valley is influenced by both Buddhism and Hindu. 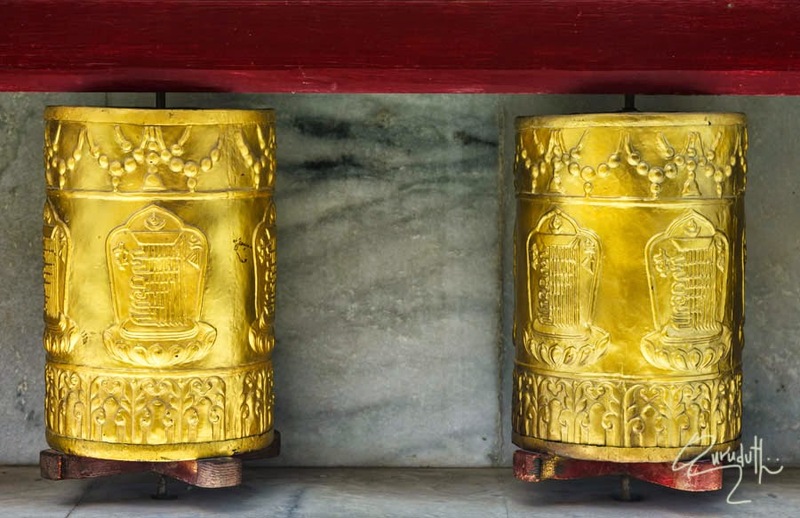 The people of Punan (Todh/Gahr) is mostly influenced by Buddhism. 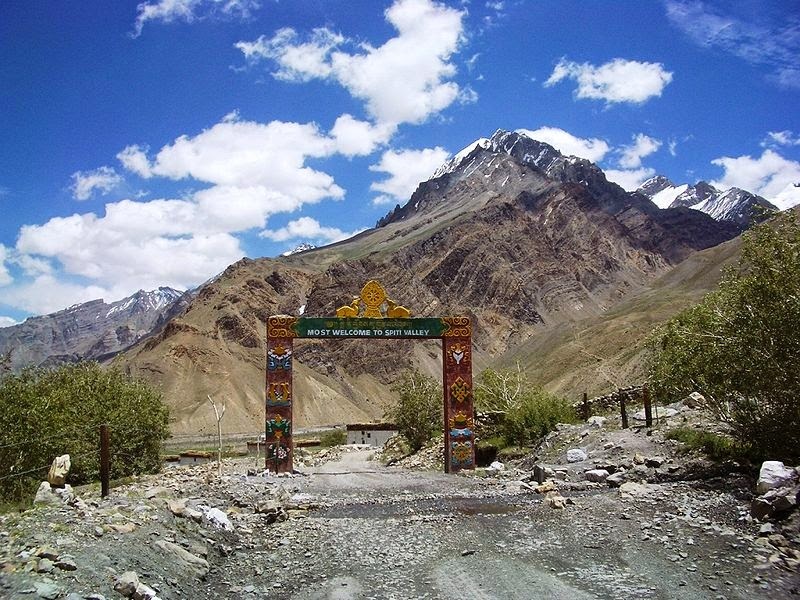 Sumdo is another (ITBP) check post ahead of Chango where we had to mark our entry to Spiti region. Foreigners are supposed to submit a copy of inner-line permit at Sumdo check post. 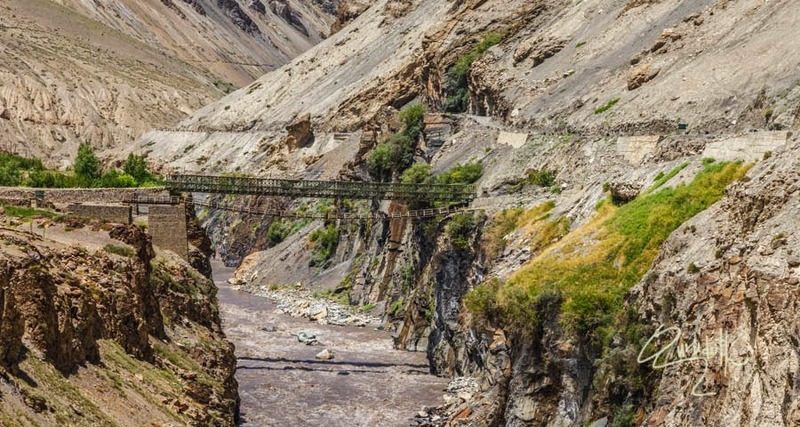 Sumdo is also considered as political border of Kinnaur and Spiti Valleys. 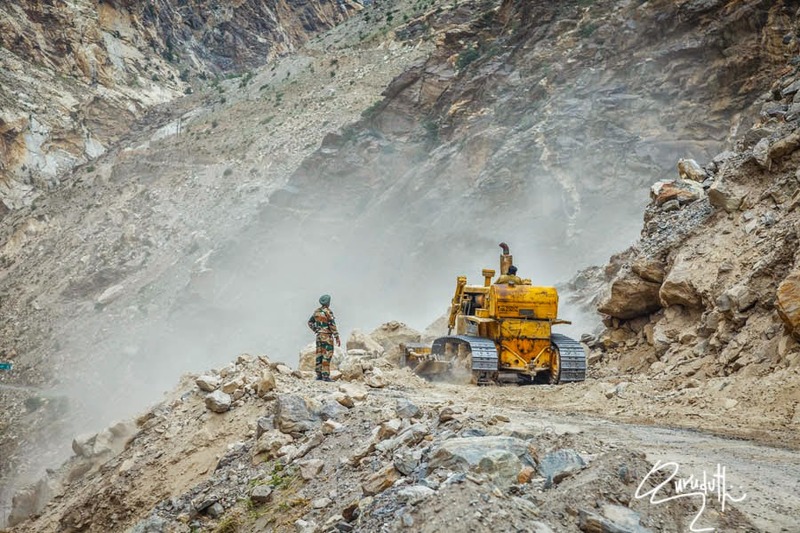 FromSumdo, detour goes upwards to Kaurik (aka: Sugar point) and Lepcha (Indian army post at Tibet Border). Indian Nationals require special permit to visit Kaurik & Lepcha. These permits are issued from ITBP check post at Sumdo after submitting valid identity cards. 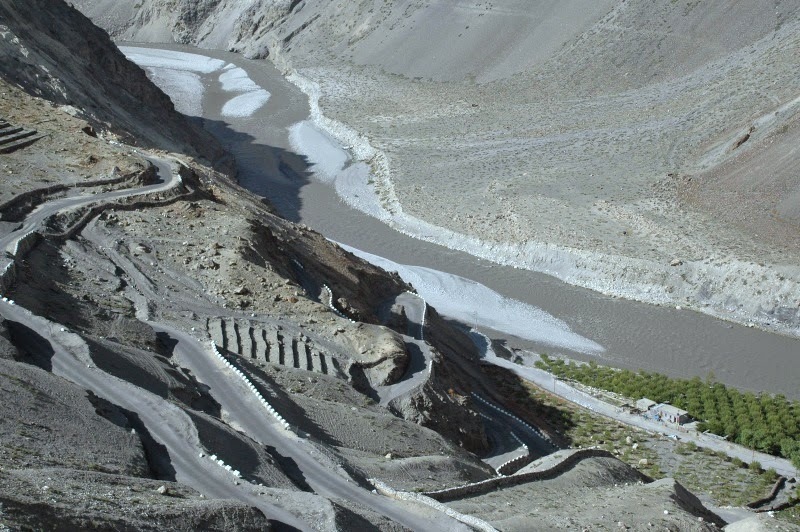 At Sumdo village facing Tabo, there are three diversions on NH-22. 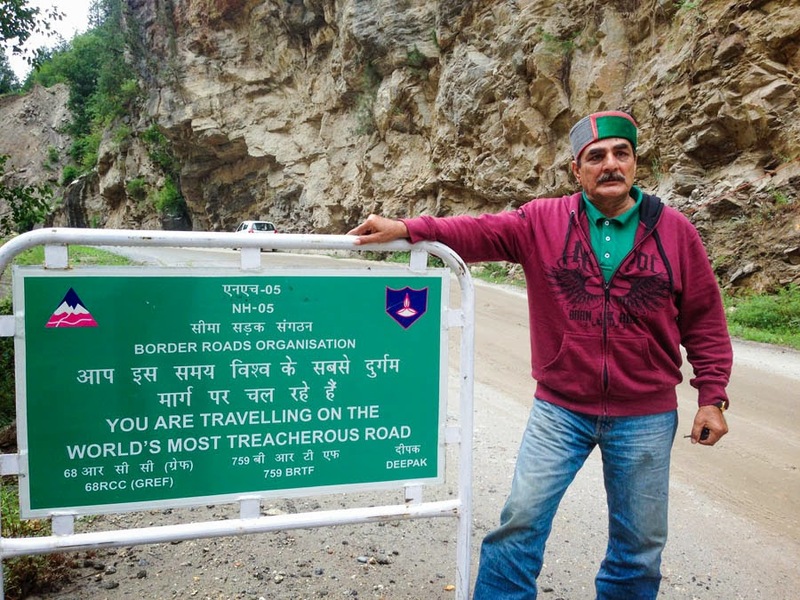 First one leads to Indo-Tibet border. 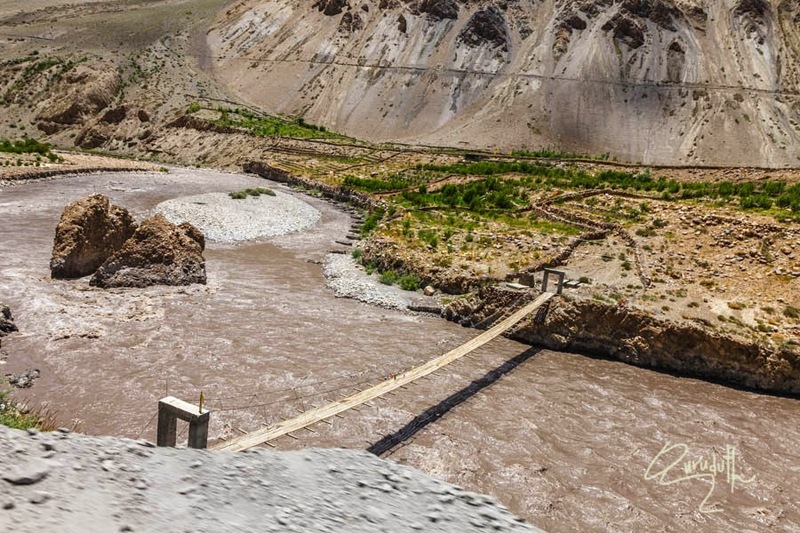 The second one leads to “GUE” village and the third one leads to Tabo village and Kaza town. The first diversion is at Right side of the road, immediately next to the check post. 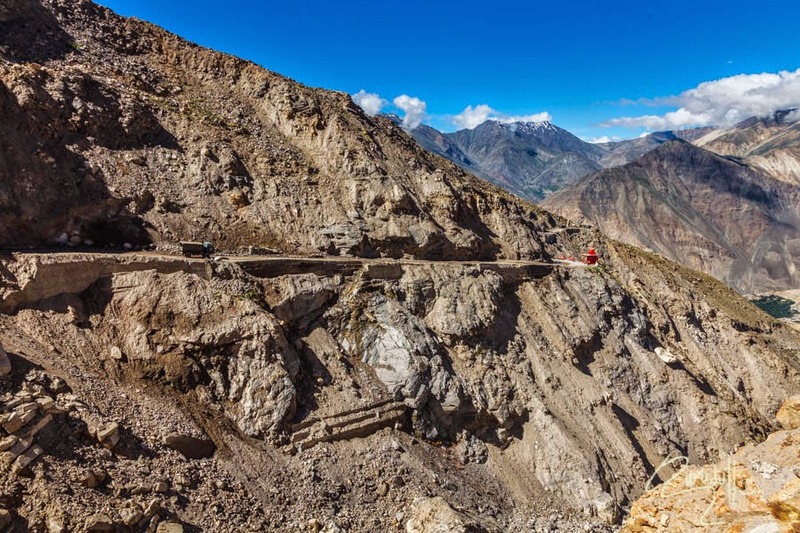 It is a very rough and very steep road on which only (4 by 4) vehicles can climb. 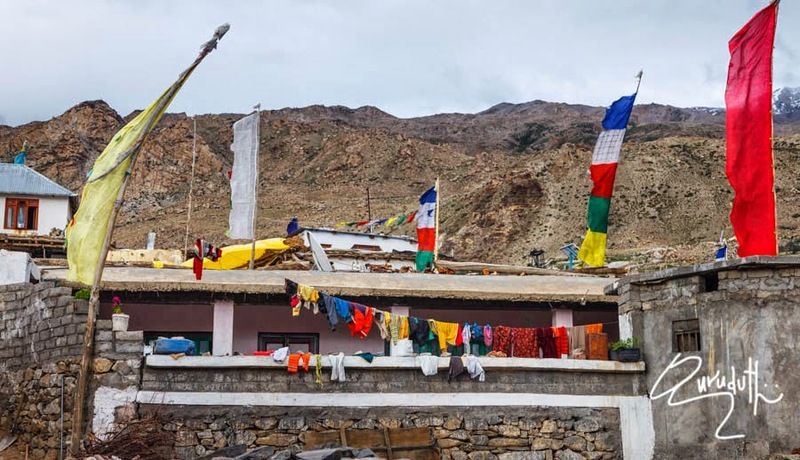 It goes right upto “Shipki La Pass which is situated at (16,000 ft) above MSL,” It is the last Indian village on this side of Tibet border. 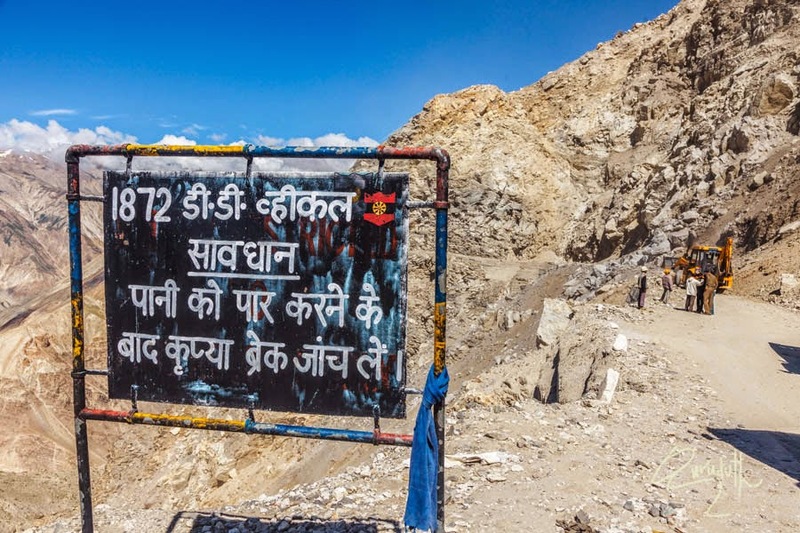 The second diversion is that, from Sumdo check Post, while driving towards Tabo, after 5 Km there is another detour on the Left side of the NH-22, which leads to “GUE” Village, which is situated at an approx (10,000 feet) above MSL. 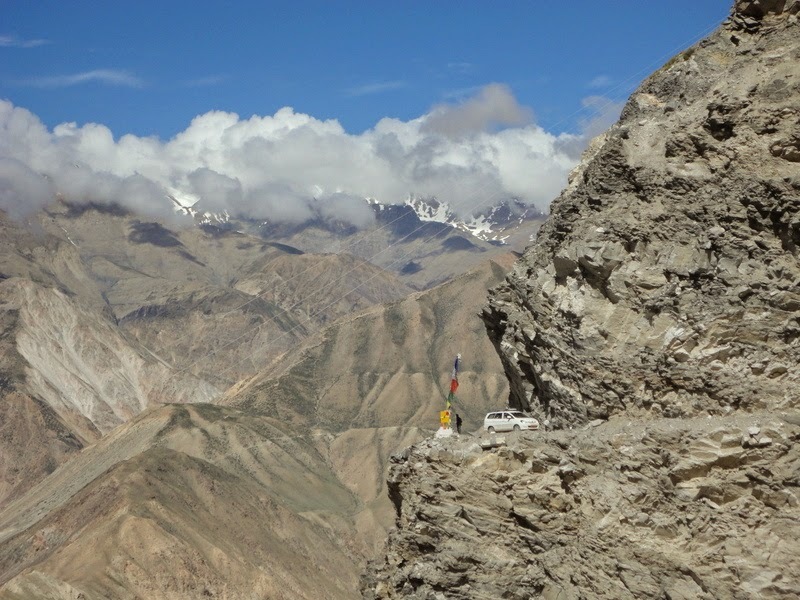 The third diversion is that, from Sumdo check Post, if we drive straight, that road leads to Kaza. 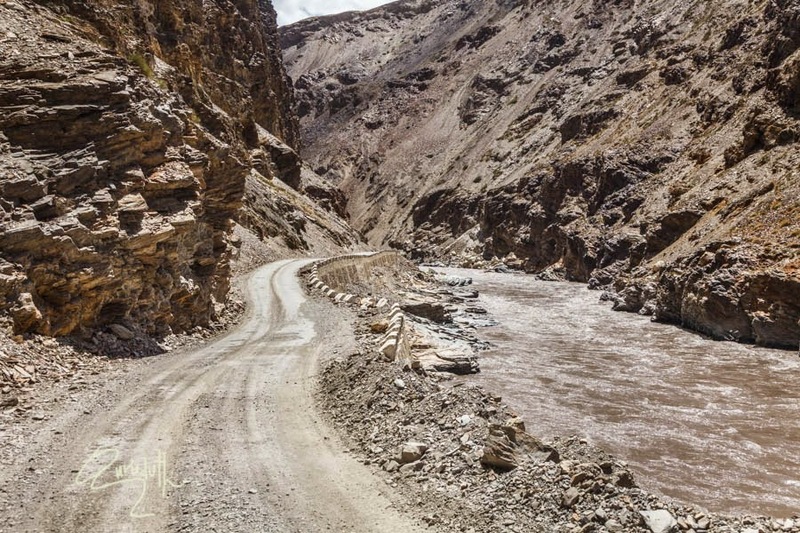 Since because of our small “ALTO” car, which surely wouldn’t have been able to climb on this steep gradient deplorable rickety road. Had Gurudatt and I taken the risk of venturing out on this most treacherous road, it would have been sure suicidal. 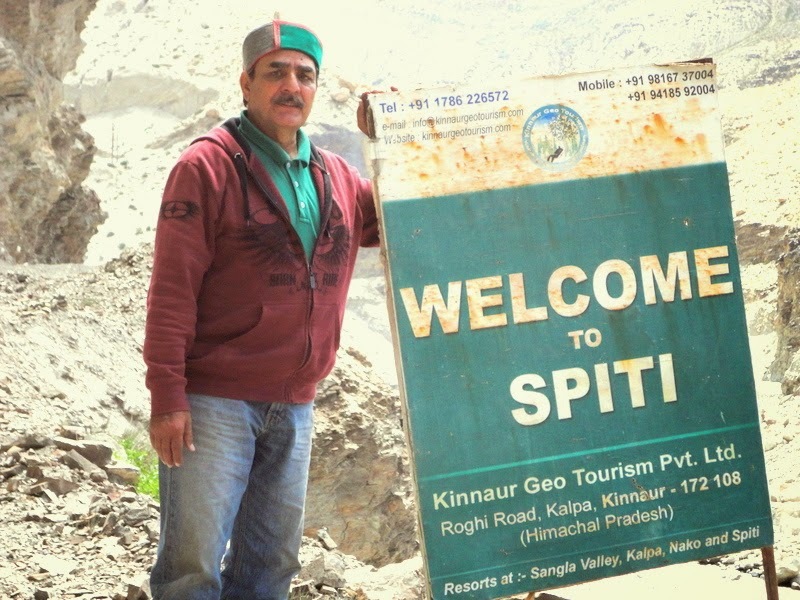 So we decided not to go to “Spiki La Pass”. More over if I am not mistaken, I don’t think if civilians are allowed to go “Spiki La Pass” unless special permission is taken from Army? To go to Gue village, while facing “Tabo” village, we have to take a Left side detour of 8 Km at “Hoorling” village. 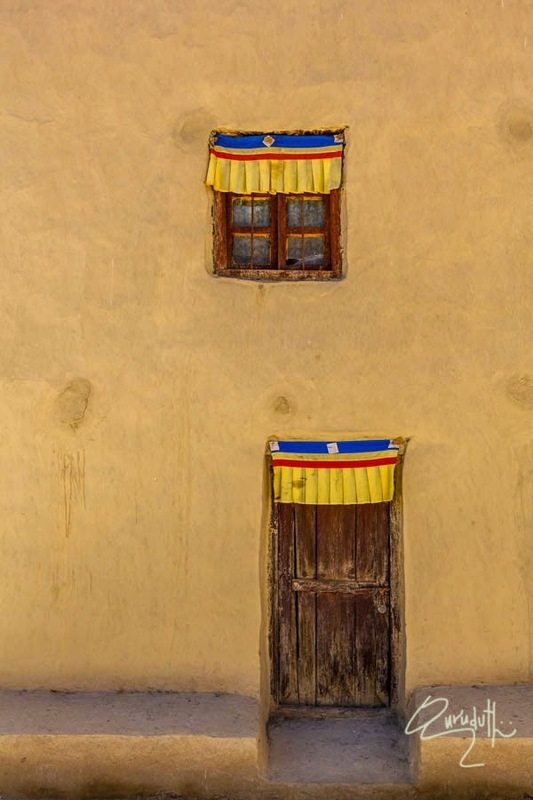 Then a colourful arch invites you into the village of “Gue”. From here, it’s an 11 km rickety drive along a deplorable narrow road abutting the mountains. 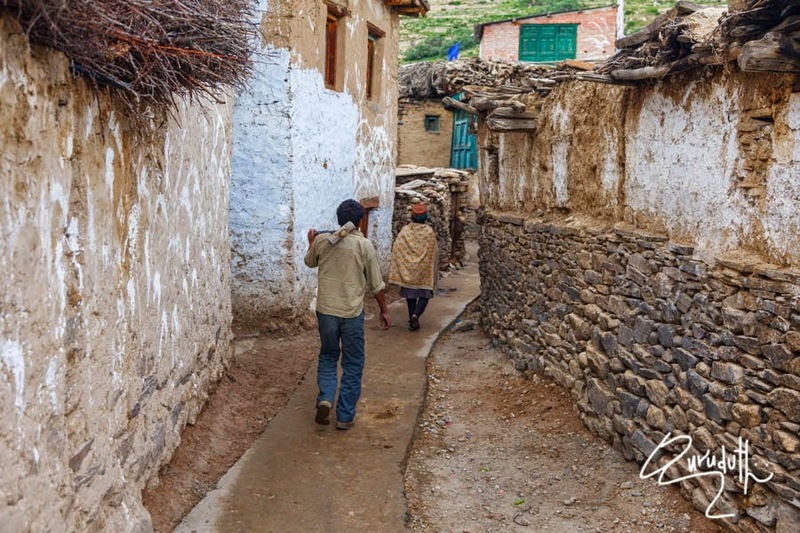 There are hardly a dozen houses in the village and the gigantic mountains engulf it from all sides. The last structure in the village, atop a small knoll, is said to house of Gue mummy. In this village there is a Monastery also. 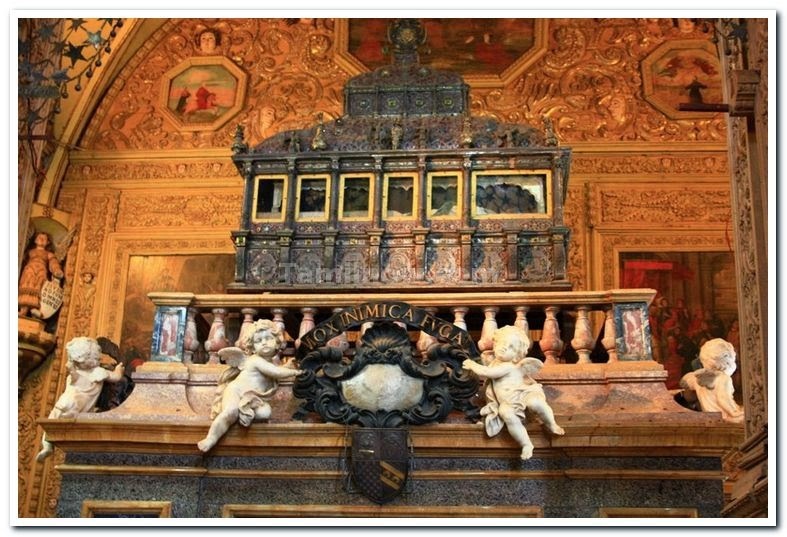 While the mummified body of "Saint Francis Xavier” was already placed in a glass container encased in a silver casket on 2 December 1637 in Goa. 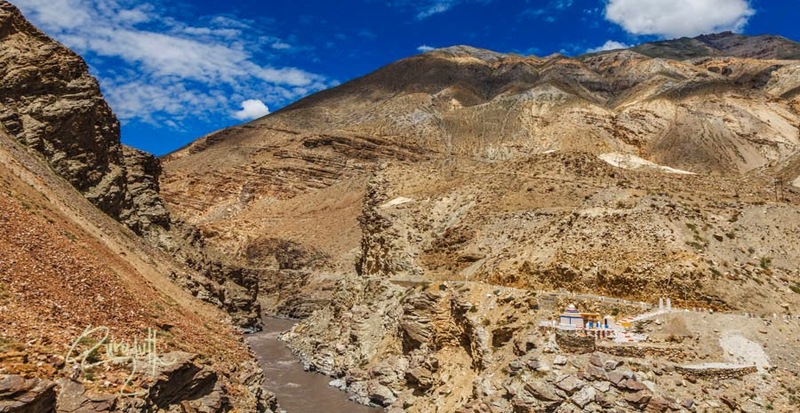 Round about the same time, a docile, humble religious divine Buddhist monk named as “Sangha Tenzin”was mummifying himself in the most remotest inaccessible part of distant India. He was painfully mediating and praying for the peace and tranquility of his fellow Tibetan Buddhist, who were being brutally ruled by Tibetan mighty “Ming Dynasty” rulers, (1368-1677). It's believed that the Lama "Sangha Tenzin" must have had attained the "Samadhi" That's why his mummified body is in the sitting position itself. His body is not laying down flat on ground. 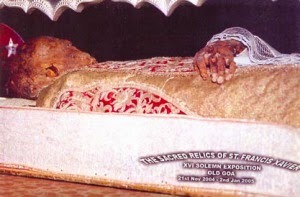 Where as “Francis Xavier” would have died of sickness, that's why his mummified body is in a flat lying down posture. Samādhi, in Hinduism, Buddhism, Jainism is a Yogic schools of a higher level of concentrated meditation, which transcends the realms of body, mind and intellect, and where the logical and analytical ability of the being becomes silent. Samadhi, being the ultimate stage of Yoga, symptomatically represents itself as the transcendental state, wherein even consciousness of the yogi might get detached from the body. 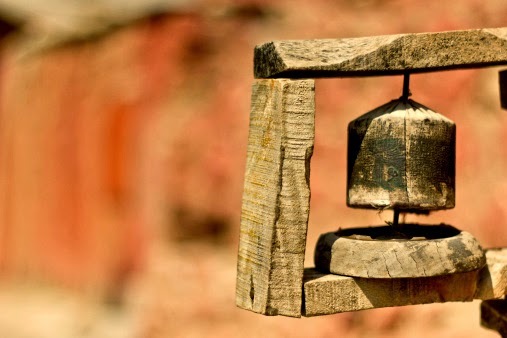 According to Bhargava Dictionary, Samadhi is the exercise of austerity of a Yogi whereby he acquires the power of suspending the connection between the body and soul as long as he likes. Yogis are said to attain the final liberation or videha mukti after willfully leaving their bodies at the time of death. It is at this time that the soul knows a complete and unbroken union with the divine, and, being free from the limitations of the body, merges effortlessly into the transcendent Self. This final liberation is referred to as mahasamadhi (ultimate samadhi) and is a voluntary and controlled exit of the soul, from the body by the fully liberated yog. The monk or Lama, known as “Sangha Tenzin” body has undergone a natural mummification.Natural mummification is an extremely difficult process in which the body is made to react in such a way that body fats and fluids reduce at a constant rate and the organs that can decay are reduced in size. A special diet is given towards the end to preserve the meat on the bone. The body is kept in a posture where the monk can continue to meditate, by using a restrainers around the neck. 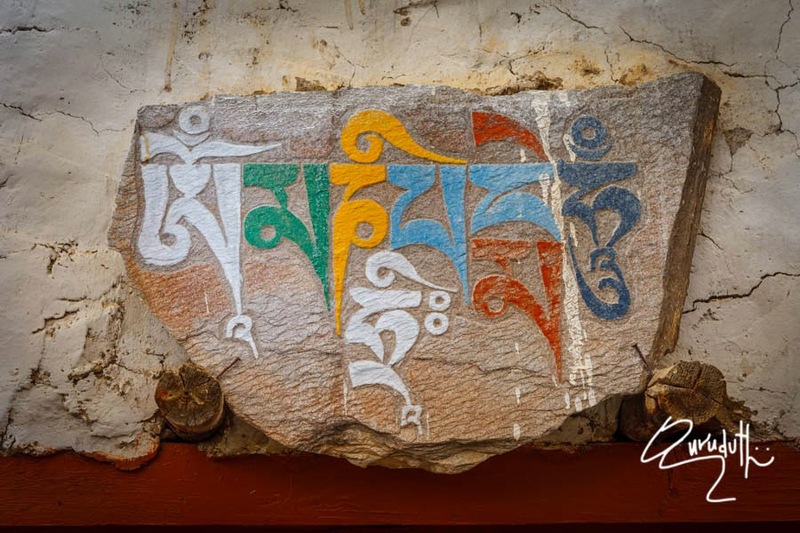 This esoteric practice is a part of the “Dzogchen” tradition in the “Nyingma” sect of Buddhism. Northern Honshu in Japan also follows this practice of natural mummification. 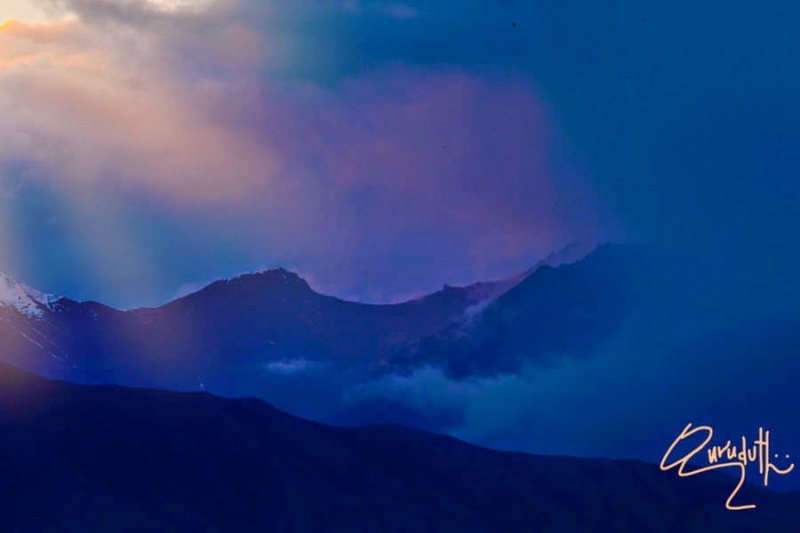 It is believed that when Sangha Tenzin's soul finally left his body, a rainbow appeared across the sky. 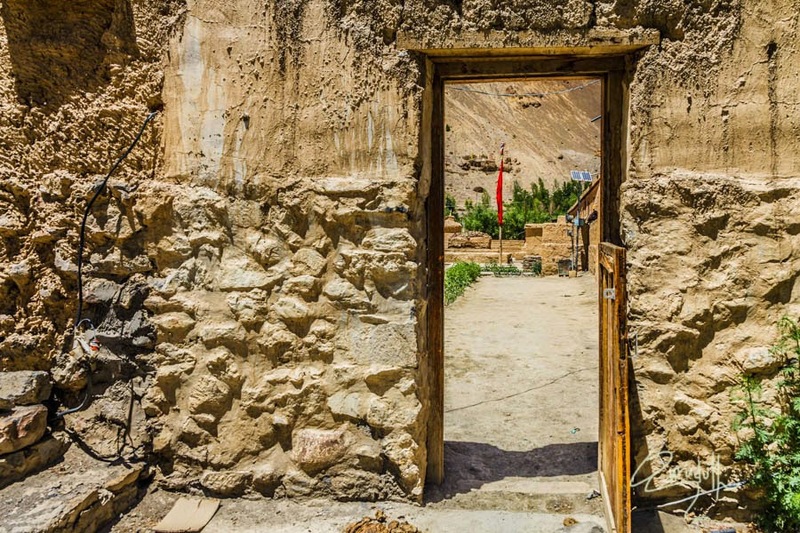 When we reached at “Gue” Lama’s temple, the entrance door was locked. We didn't know whom to approach for unlocking the entrance door. An elderly looking Buddhist might have seen us from a distance, while we were driving towards the village. He took an exhausting sprint just to ensure that we don’t return back without paying homage to “Gue mummy". He unlocked the Temple door and did show us the Lam's mummy and the temple. He was so humble, respectful and hospitable to us, that just to express our gratitude’s for his generous efforts, we offered him some money but he adamantly refused to accept and smiled absently. He robbed our hearts. A very rare incident, just to find such a solemn masterpiece of human in our present day wicked world. As we stepped inside of the Lama’s temple. It was an amazing experience to see with our own naked eyes that “mummy” of a sitting Lama, who is now enclosed in a glass cubical house. As we step inside, a closer observation revealed that Lam’s has empty eye sockets and the broad forehead. The mummy is amazingly by nature itself well-preserved with unbroken skin; teeth, nails and bristles of hairs on his head, fully intact. 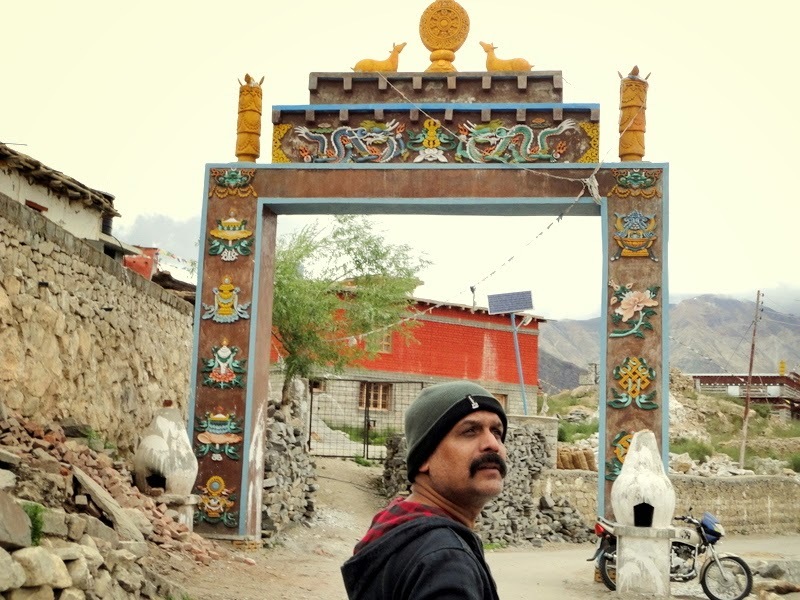 When we inquired about the mythology of this mysterious Lama, he told us of how blood oozed out of the ground when people were digging the area to build houses. This led to much fright and furor among the villagers and on further careful digging, the mummy was found. The silk robes on him seem to conceal the tremendous POWER and WILL that he must have had to undergo the mummification process. We inquired from that elderly gentleman who opened the doors for us of “Gue Lama’s” temple , “How old is this Gue mummy?” He replied, “Sons, it is difficult to say, may be 500 years, 600 years or may even more. 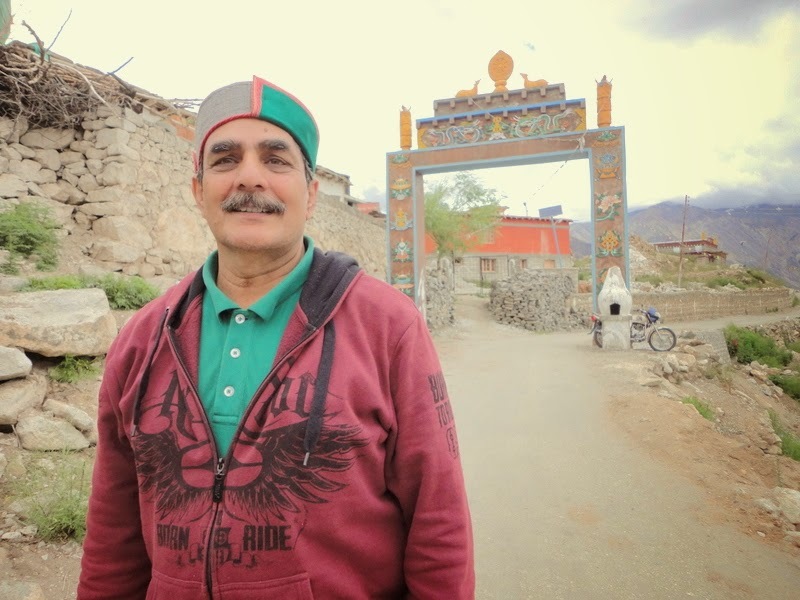 In fact no one knows exactly how old Gue Lama is, but he has been protecting and blessing our whole region down the ages.” He added with an astounding abundant faith, “MUMMY LAMA IS OUR LIVING GOD”. 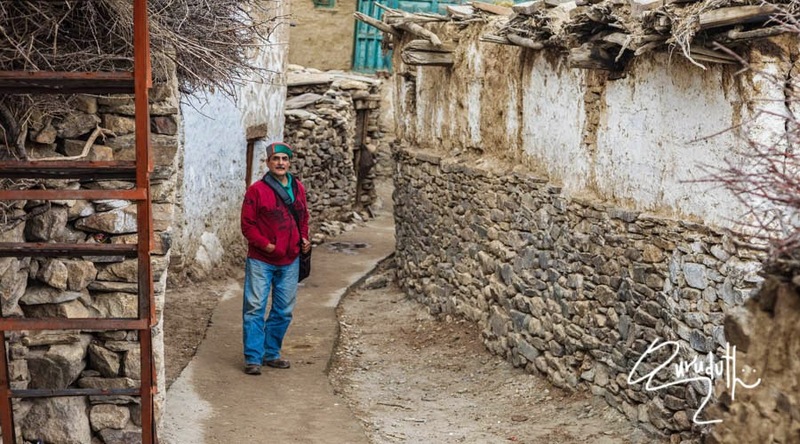 Local people here around this Gue village, with respect, religious faith and conviction call this Lama as “MUMMY LAMA”. It is believed that this revered lama was a Tibetan monk named Sangha Tenzin, who gave up his life about 600 years back while meditating in the squatting position. 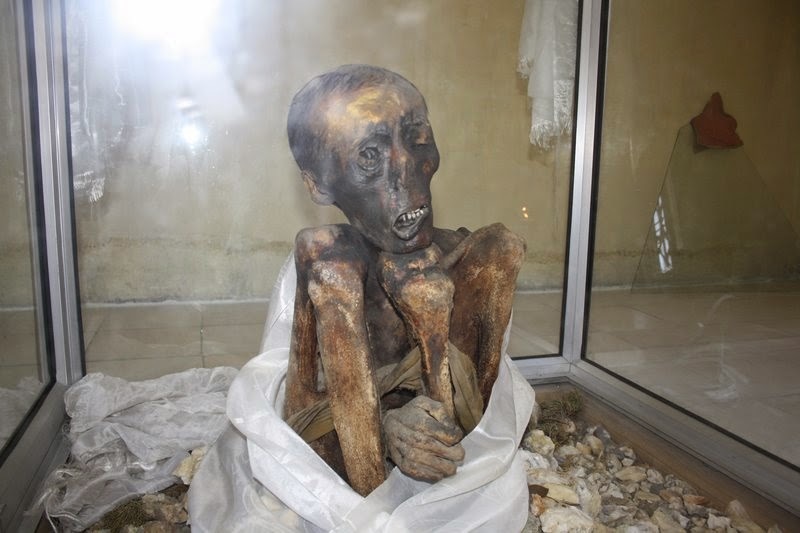 He was discovered mummified inside a tomb. 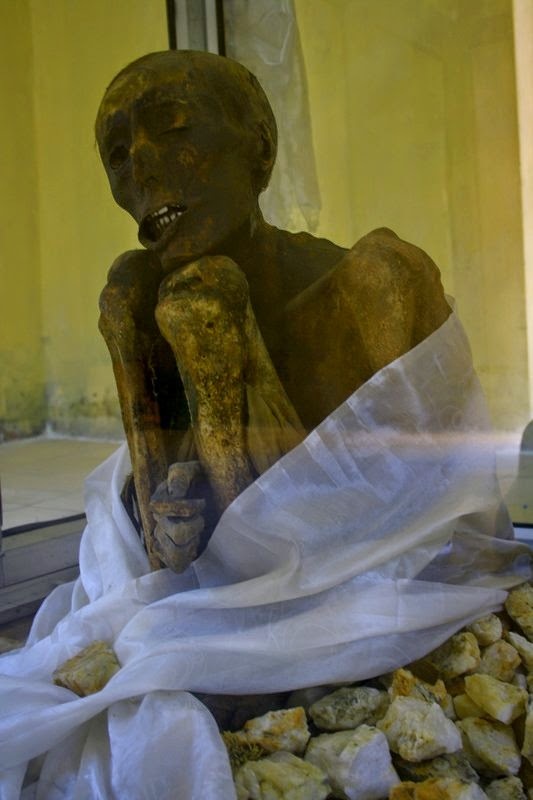 The locals of Gue knew about the mummy only since 1975, when an earthquake brought down a part of the tomb. But the sheer remoteness of the area kept it out of bounds. Carbon dating carried out by some foreign scientists estimated it to be about 550 years old. 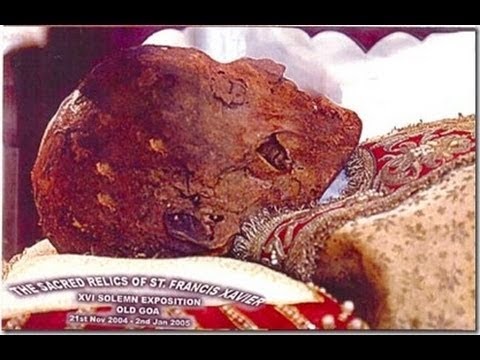 The body of Saint Francis Xavier, too got naturally mummified. Saint Francis Xavier, SJ, born as Francisco de Jasso y Azpilicueta (7 April 1506 – 3 December 1552), was a Roman Catholic missionary born in Xavier, Kingdom of Portugual. He too was a divine missionary appionted at Goa, who helped and anointed people suffering from incurable diseases, relieved devotees from their miseries. Most of his life, he spent in and around Goa. He was a noble soul. On 3 December 1552, he died in China at Shangchuan Island (Present day Hon Kong). 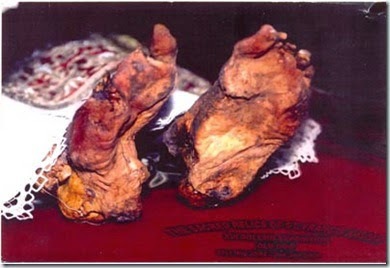 Somehow by the divine natural process, even his body too got mummified. On 11 December 1553, Xavier's mummified body was shipped to Goa. The body is now in a church of the “Basilica Of Born Jesus” in Old Goa, where it was placed in a glass container encased in a silver casket on 2 December 1637. 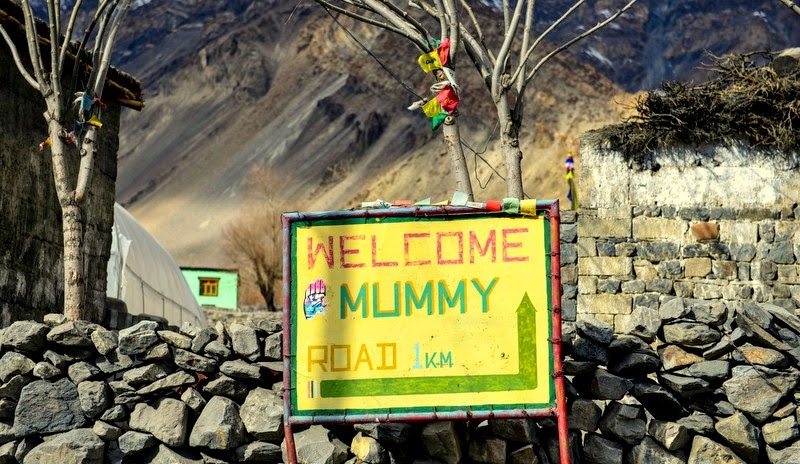 After driving down back from “Gue” mummy village, we joined the main road at “Hoorling” village which is 9 Km away from “Sumdo” From Hoorling, Tabo is 19 KM. 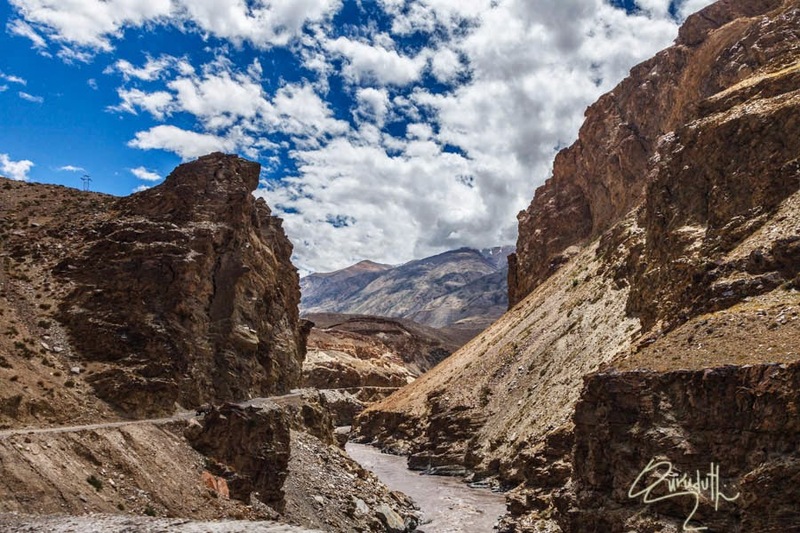 All around this region, where ever eyes can see, its barren, arid, infertile land surrounded by huge mud mountains, whose peaks are cover with snow and Glaciers. No trace of trees, greenery or even a speck of grass can be seen. The whole area is like any desert. 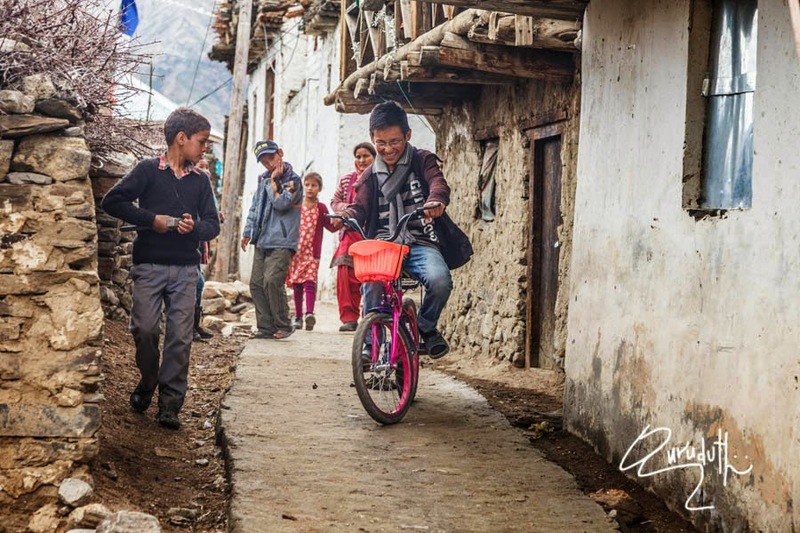 Inbetween “Hoorling” and “Tabo” we come across a small village called as “Lari” which has a population of 235 people only. 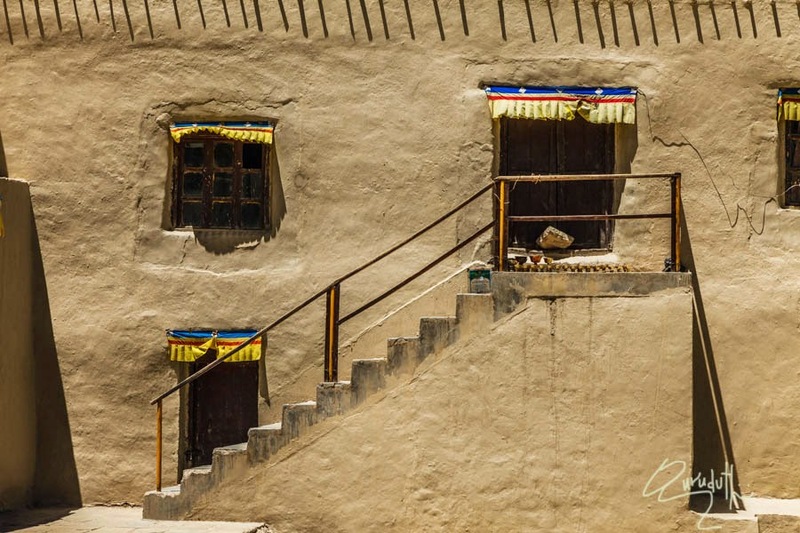 Tabo is a small town on the banks of the River “Spiti”. It has a population of 450. 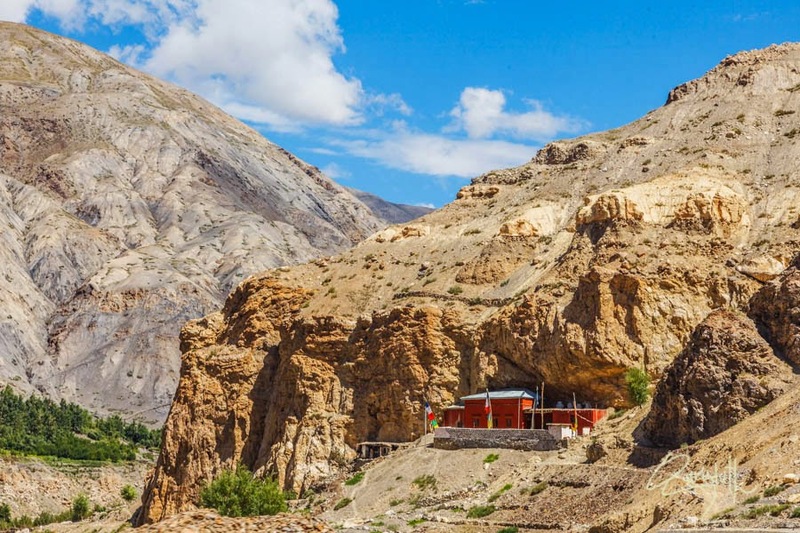 It is the sub-divisional headquarters of “Spiti”. 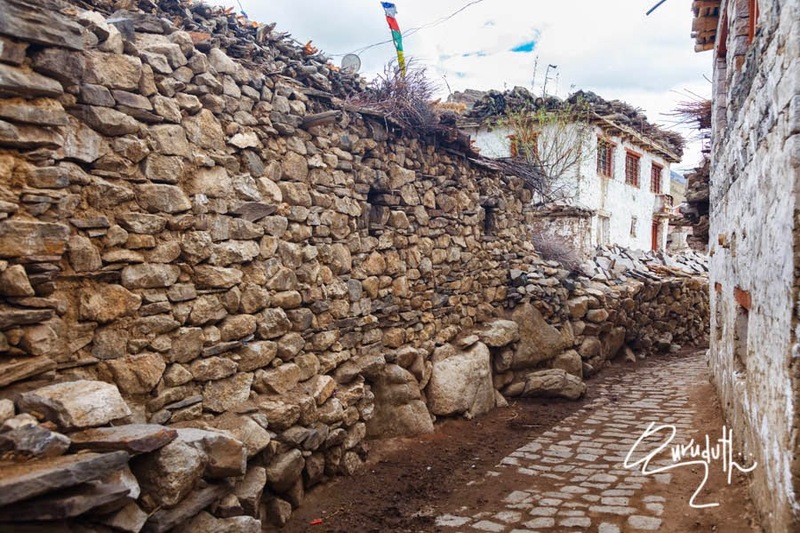 The town surrounds a Buddhist monastery which, according to legend, is said to be over a thousand years old. 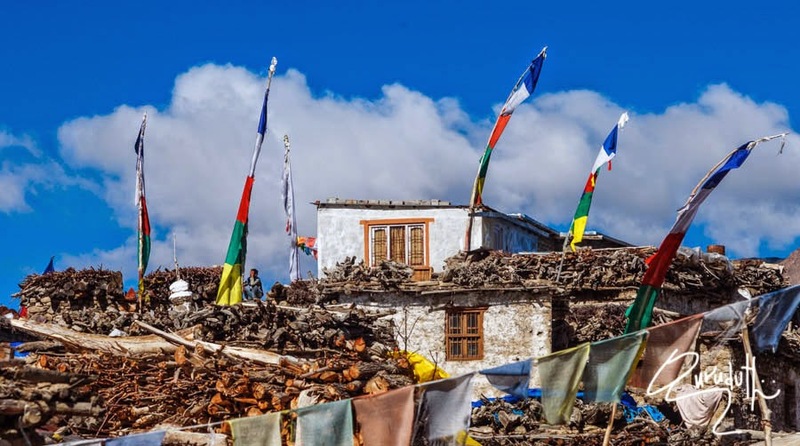 His Holiness the “Dalai Lama” had expressed his desire to retire at “Tabo”, since he maintains that the “Tabo Monatery” is one of the holiest “Monasteries”. 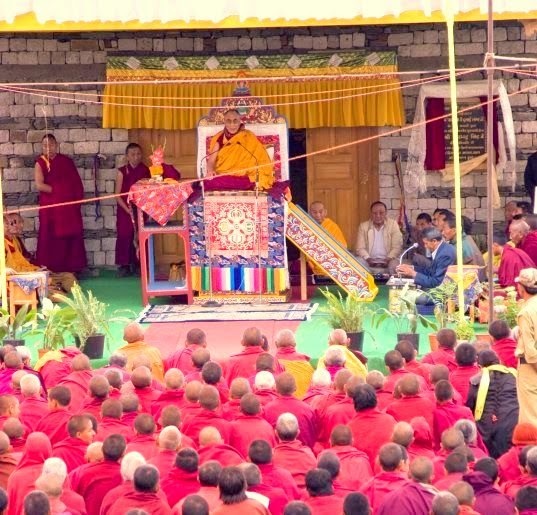 In 1983 and 1996, HH the 14 th Dalai Lama conducted the” “Kalchakar” initiation ceremony in Tabo, which coincided with the millennium anniversary celebrations of the Tabo monastery. The ceremony was attended by thousands of Buddhists from across the world. Tabo Monastery's present spiritual head is “Tsenshap Serkong Rinpoche”. 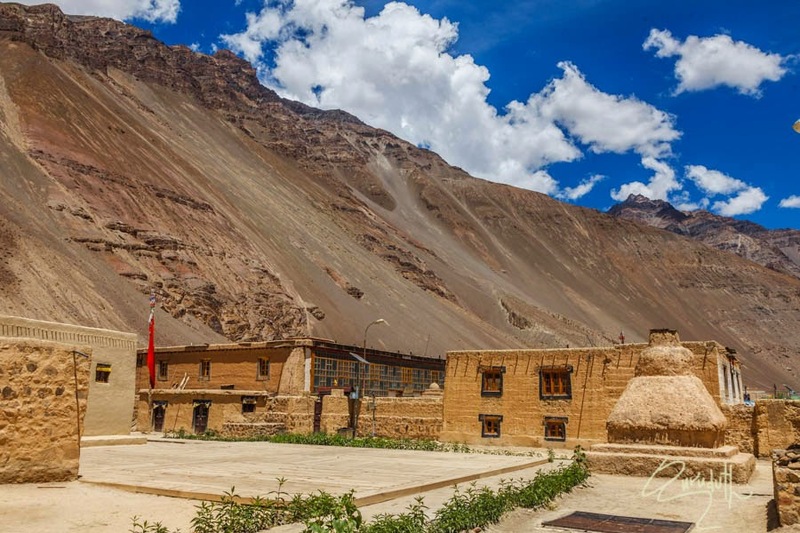 Tabo Monastery (Tabo Chos-Khor Monastery) was founded in 996 CE in the Tibetan year of the Fire. Ape. by the Tibetan Buddhist Lotswa (translator), “Rinchen Zangpo ”(Mahauru Ramabhadra), the king of western Himalayan Kingdom of “Guge”. 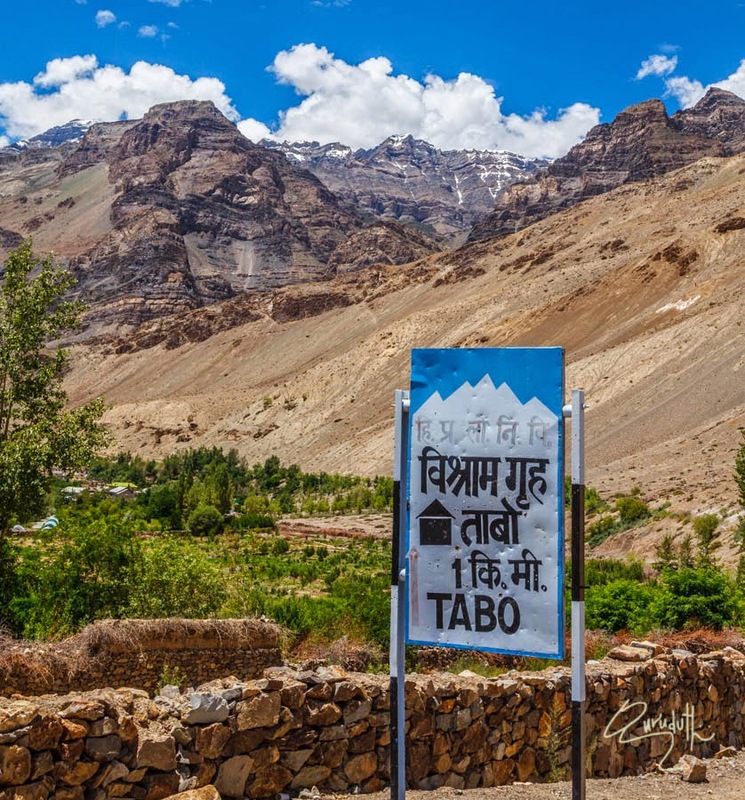 Tabo is noted for being the oldest continuously operating Buddhist enclave in both India and the Himalayas. A large number of frescoes displayed on its walls depict tales from the “Buddhist Pantheon”. There are many priceless collections of “Thankas” (scroll paintings), manuscripts, well-preserved statues Frescos and extensive murals which cover almost every wall. 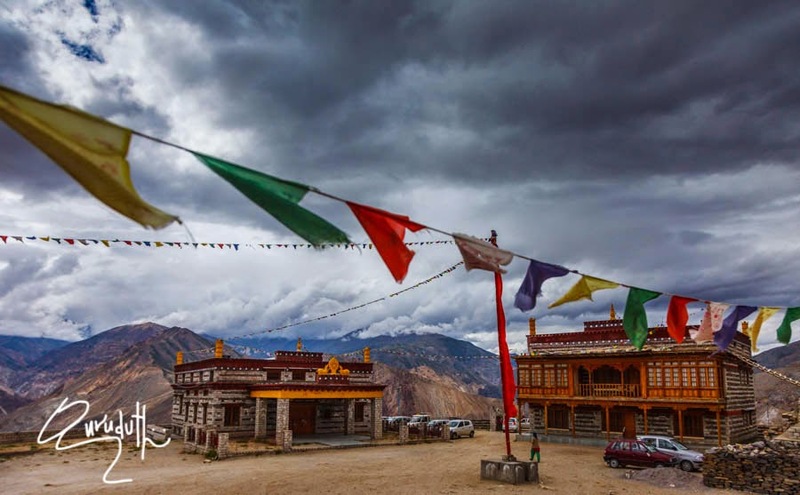 The monastery is in need of refurbishing as the wooden structures are aging and the “Thankas” scroll paintings are fading. After the earthquake of 1975. The monastery was rebuilt, and in 1983 a new “Du-kang” or Assembly Hall was constructed. 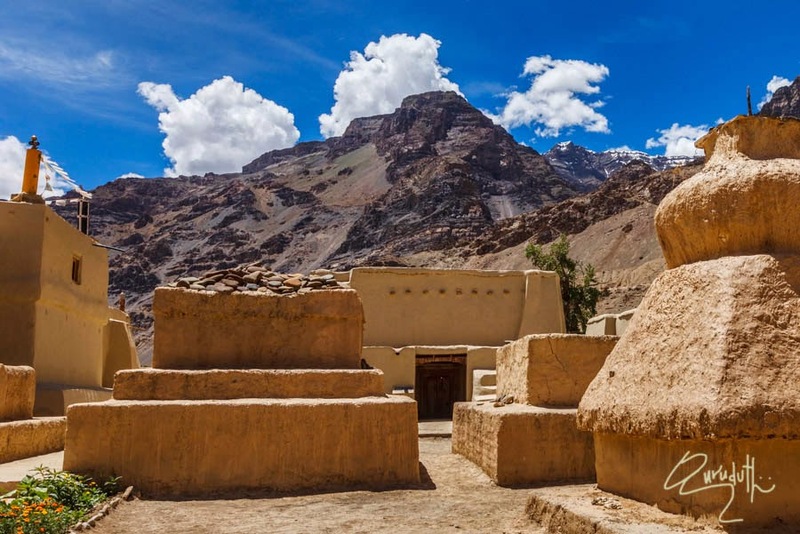 The monastery is now protected by the Archaeological Survey of India (ASI) as a national historic treasure of India. New monastery is under construction. After visiting the “Monastery”, we had our Lunch at a "Name-less" small restaurant. After the lunch as we were getting ready to proceeded toward Kaza town. Here also the local drivers again asked us where were we heading to? 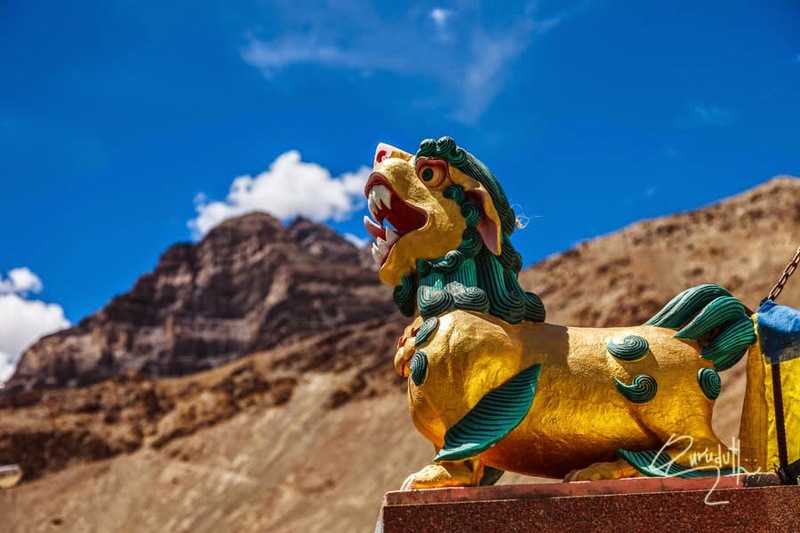 And we said, “Leh-Ladakh” In disbelief their mouths too fell wide open and their heads too shook repeatedly, in negative gesture saying “Oh No”, not possible? 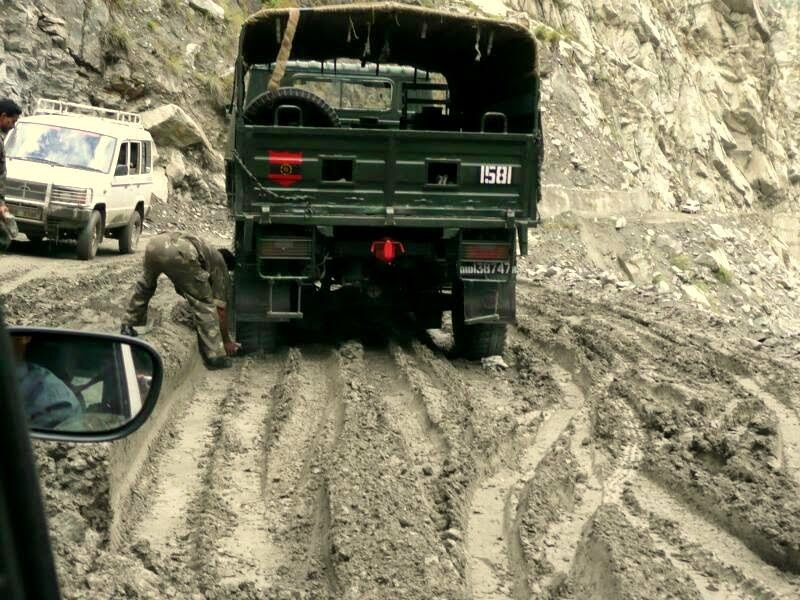 Then they also warned us about the dangerous condition of the further treacherous road. 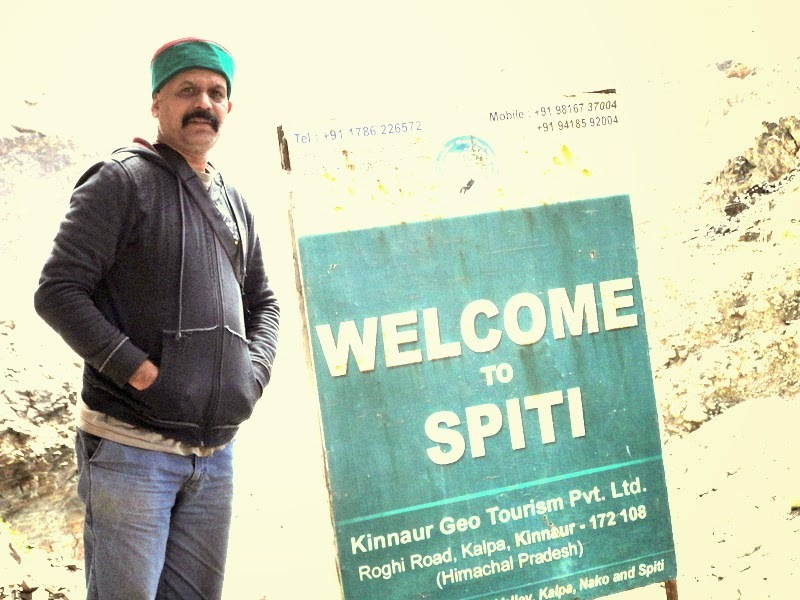 They also seriously suggested us that it was better we turned around and went back via Kullu, Manali, Rohtang, Leh Road. 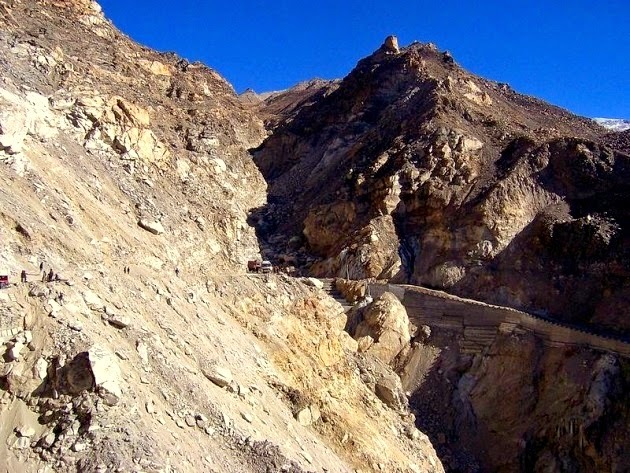 Anyway since we has reached till here, we thought let's take a chance and continue towards Leh Via Kaza, Kunzum La Pass itself. Next chapter of my Blog’s to be continued. Thank you very much for the description and the photographs. The description is interesting because it is first hand. Such description is only possible when you are at place. The photographs are breath taking giving more details that you have given. I think all these travelogues should be compiled together in a book. It will be definitely a GUIDE to the future travelers who will venture in such places where only eagles can dare. Prayers for your excellent health which will enable you to go to such places which have remained untapped till date. Truth be told, many of the best beach locations on the planet happen to be located in Dubai, UAE. Typically the beautiful white sands of Travel Agent in Dubai seashore will astonish tourists, since most people probably wouldn't consider that this type of natural wonder could really exist inside of the Middle East. Most of the time, used diesel generators are a last resort when there is no other form of electricity available. TC Tippers not having a power source is sometimes a real pain in the neck, so if you're interested in buying something like this to help you out then you should look online. Nowadays, exotic Car Rental Sicilys are growing in popularity. This is most probably due to the expensive price of antique and luxury cars that people have to resort to rentals because they simply cannot afford to own a brand new one. Most people don't want to invest in something so expensive that even maintenance fees are too costly.